I have never been as close to a forest fire as we are right now. Currently the Eagle Creek Fire is at Multnomah Falls, threatening to burn the lodge there. The smoke and ash here in Portland is heavy, the sun is orange through it all. We are about 35 miles away from the actual fire… which is only one of many in the Pacific Northwest right now. So many trees, animals, parks, trails, homes, businesses along the Columbia Gorge and throughout the PNW – one of the most beautiful places I’ve ever seen (and hence my move here) currently looks like a scene out of an apocalyptic movie. We are sending positive energy out to all the firefighters risking their lives to try to stop this devastation, as well as wishing for some real rain. I’m currently sitting in our closed-up house trying to deal with its stagnant heat. The air quality outside is terrible and my throat/lungs hurt. Wishing we had air conditioning right now, but at least we don’t have to evacuate as so many others have. Meanwhile, hurricane Irma is set to hit the East Coast, and people in are still in dire need after Harvey. Can we just agree that climate change is real – and start actually doing something about it? 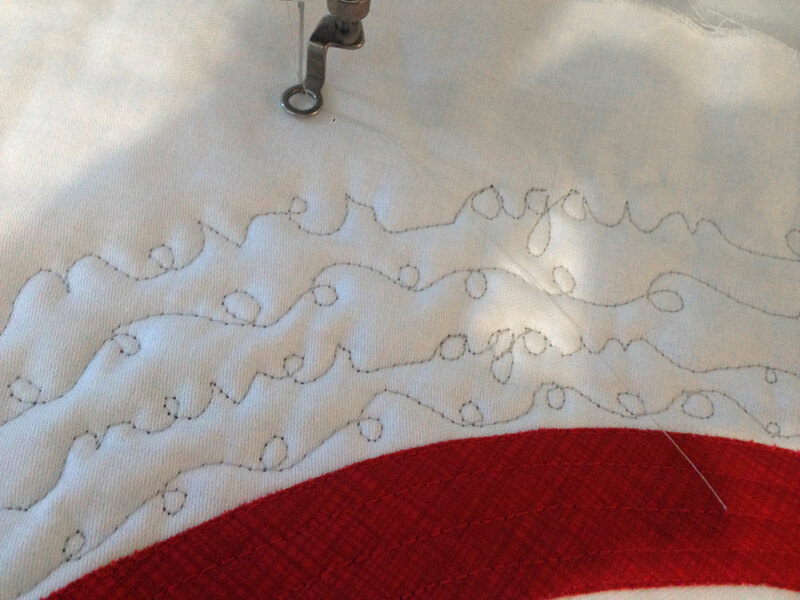 I do have a small quilt project in the works that I’m looking forward to sharing… but for now, all my energy is spent. Love to all – especially the firefighters and others who risk their lives for the rest of us. This is a political post – and one I think is extremely important. After our president gave speeches which supported Nazi movements after the violence in Charlottesville, I felt so frustrated – and overwhelmed by the numbers of people who are fighting for ethnic cleansing, and by our supposed national leader egging them on. I’m not surprised at all… but definitely on watch. Then 2 days ago I saw an image online that really spoke to me. I kept going back to it all day – then I decided I just had to make a quilt of this image… so I did! 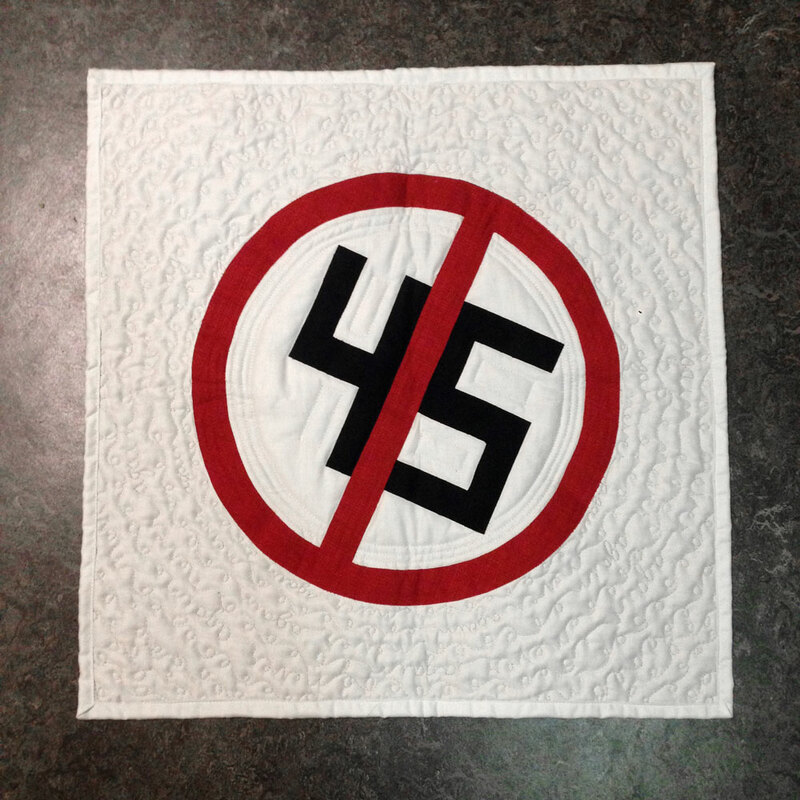 It’s entitled: “Never Again – or – No War, No KKK, No Fascist USA” and I quilted the words: never again all over in the background. 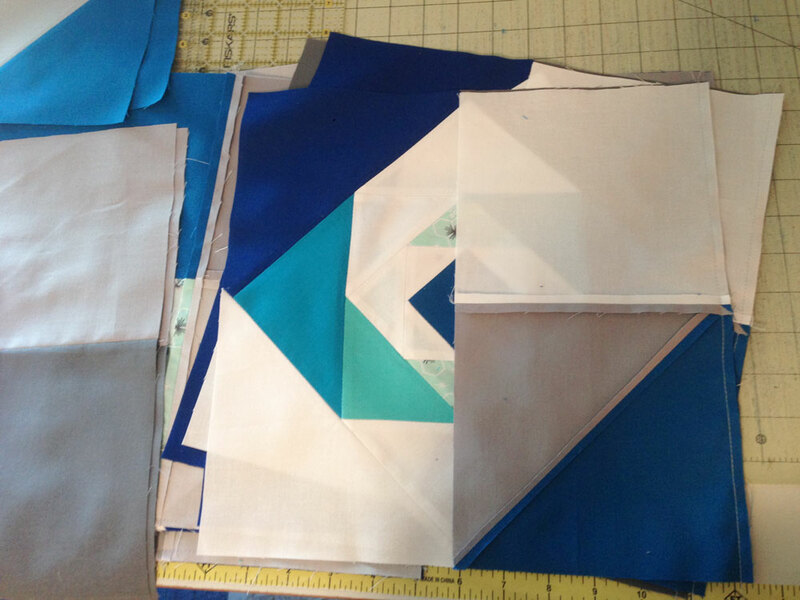 It was cathartic and felt great to do something… even as bitty as making a little quilt. 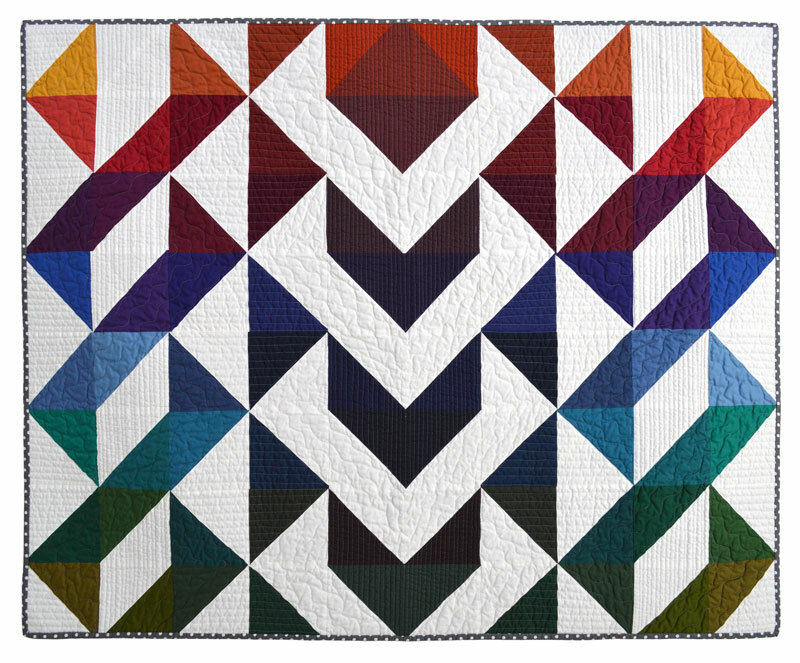 I made it in one day so I could take it to my Portland Modern Quilt Guild meeting last night where it met with great support! (I love my guild!) I posted it on IG and FB and I started getting compliments on the design – and I realized I need to do due diligence to find the original artist and get approval before trying to enter to shows, …or in case it goes viral. Luckily for me, a friend knew who created it and I was able to contact him and he gave approval to share as much as I like. His name is Mike Mitchell and is an amazing artist – please go see his work and be supportive – that is one clever guy, and really sweet too. I’m so thankful – I should have asked prior to making it… but I was totally caught up in the moment. I’m thinking that the ACLU really needs to re-evaluate standing up for fascist movements having free speech. Any speech that pushes the idea ethnic cleansing – should never be protected. When the fight is murder vs. humanity – the lines should be clear and simple. No one should have to fear extermination due to their sexuality, the color of their skin, where they were born, or for what they spiritually believe (unless that belief entails killing others). 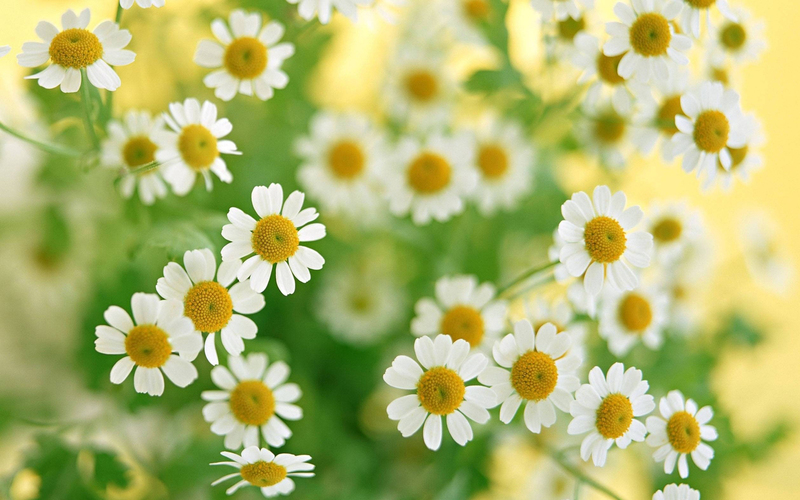 To be tolerant of all things – one must never be tolerant of intolerance itself. It’s been warm here in the Pacific Northwest over the last few weeks. Some days made it into the 100’s even… luckily we don’t get any real humidity here, so it can be tolerable – but just barely. I think the heat affects my motivation in a big way. It makes me swell up and get tired, so I just want to sleep all the time. 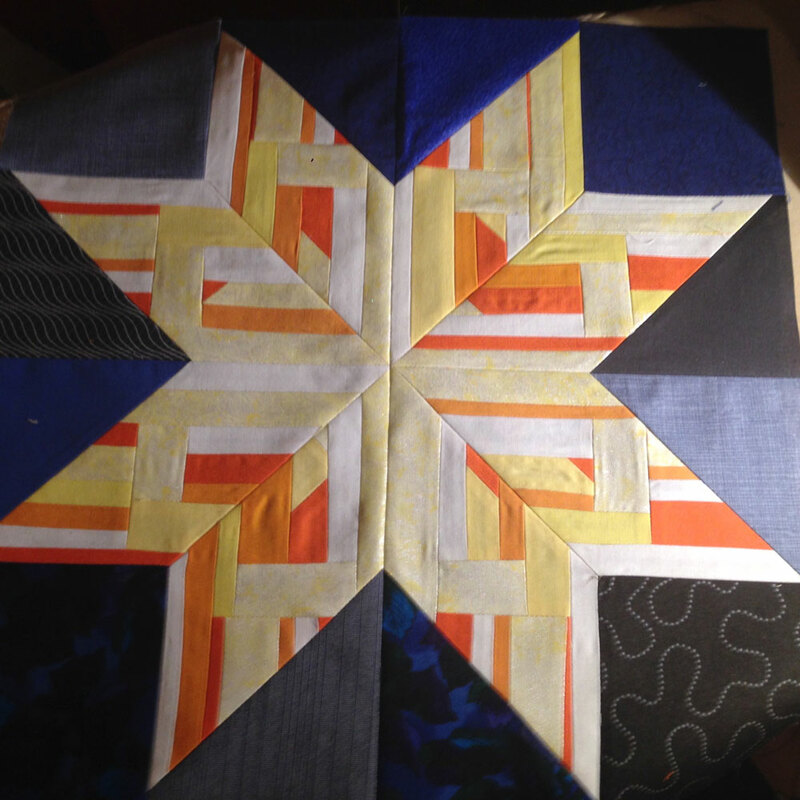 Plus, this is our busy time of year for work, so I haven’t done much sewing lately – except for the Portland Modern Quilt Guild Block of the Month project. It’s been really fun so far! I just finished #7 of 9. 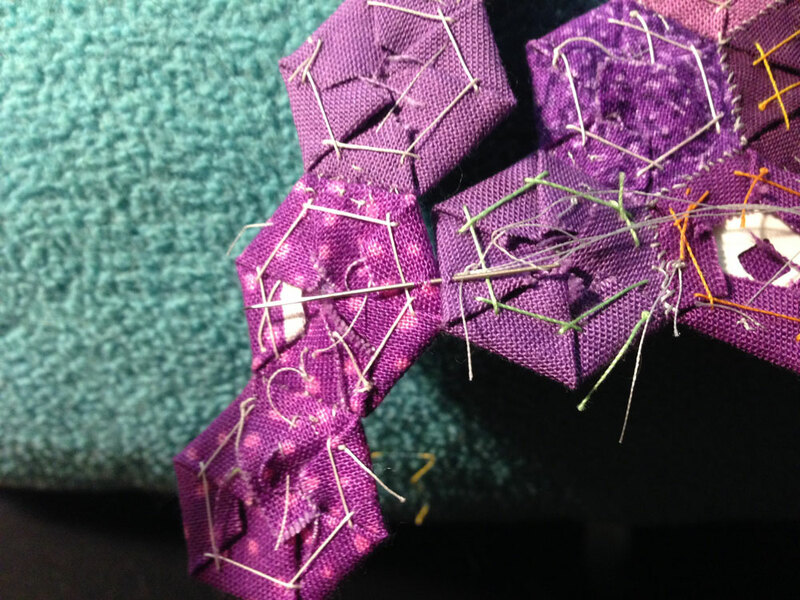 Only 2 blocks left, so I get to practice my patience while I wait for the next two patterns to be released. 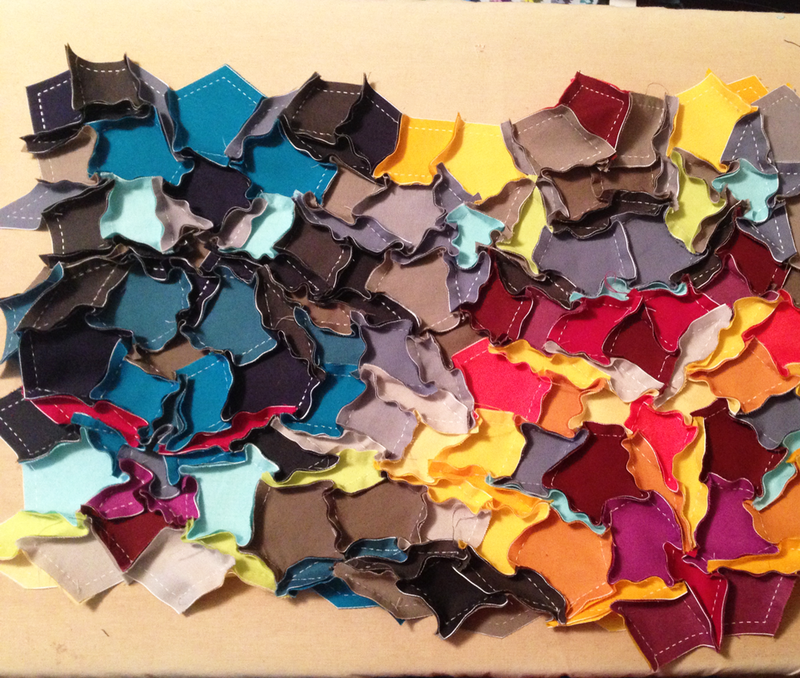 I posted on IG and FB yesterday and got a lot of great feedback on my color choices. 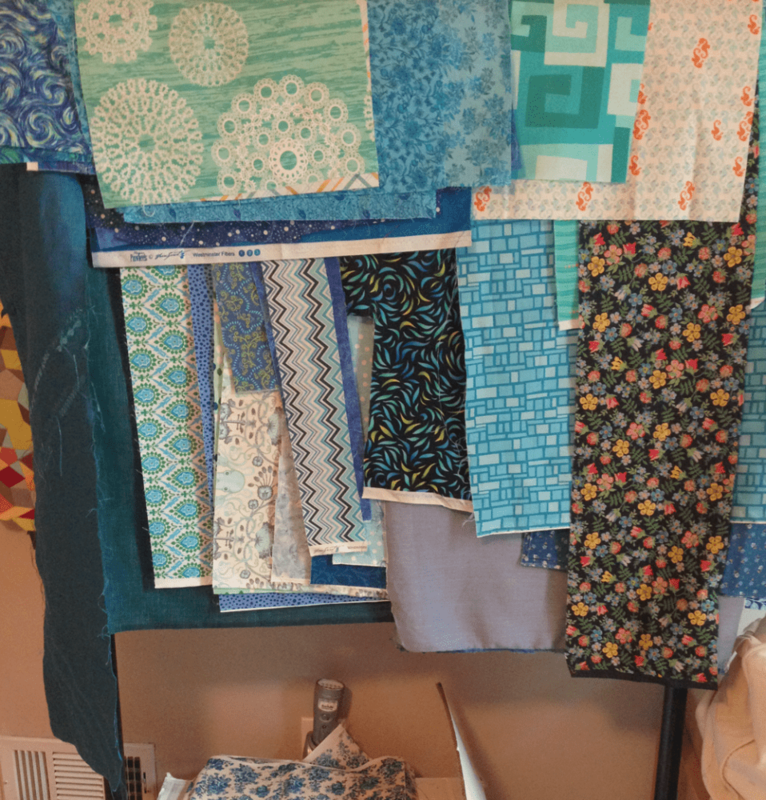 I’m thrilled because I’m trying to use up my stash, and didn’t allow myself to buy anything new for this quilt. 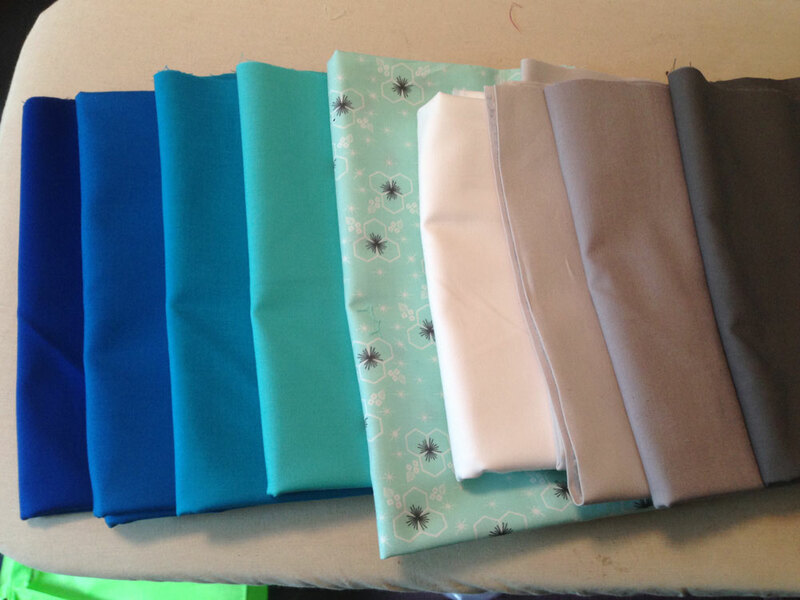 Since it finishes at 76″ x 76″ – there is a lot of fabric to pull. 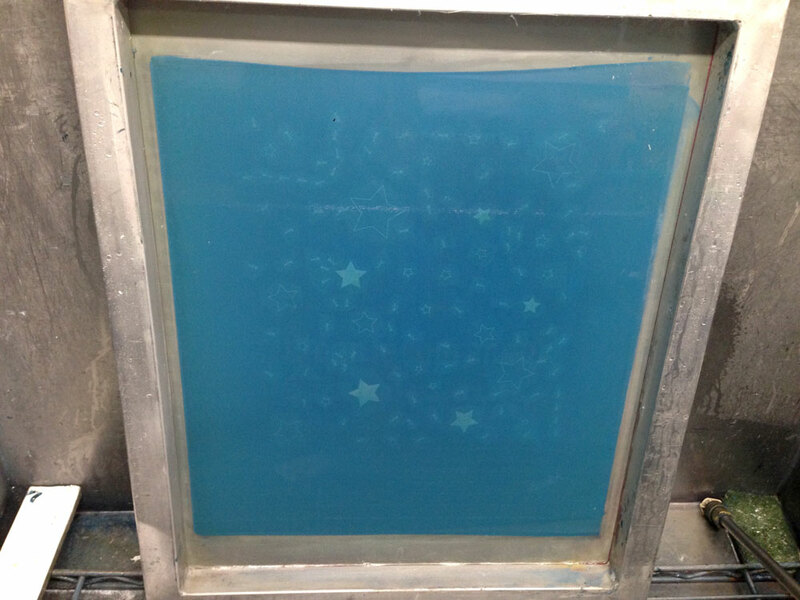 I had a vague idea of how much I needed for the background squares, and I knew I wanted a night sky… so I pulled all my dark blues – which wasn’t much. 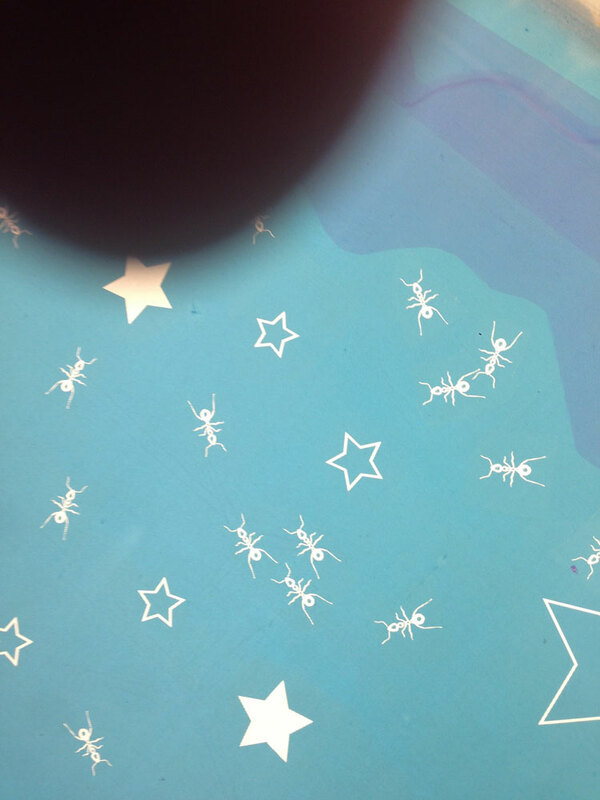 I had to amend with greys and light blues, and the mixing of these seemingly un-matching colors really makes it sparkle! 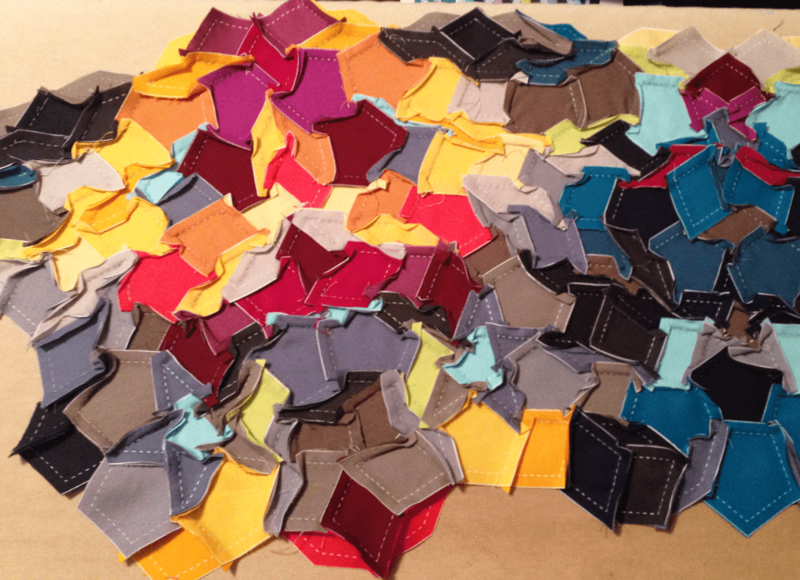 Another thing I’m working on right now is making patterns for all my hexie quilts. The Dragon and Squid were done in the past, but I’m re-vamping them to match the newer patterns for the Jellyfish, Hummingbird, and that little placemat. I’m almost done, and when I am, I think I’m going to try to do a give-away. I’ve never done one of those before, but I think it would be fun, and I’d love to share my work that way! I’ve been having fun playing with designs lately, and I just made another that I like enough to offer to others! 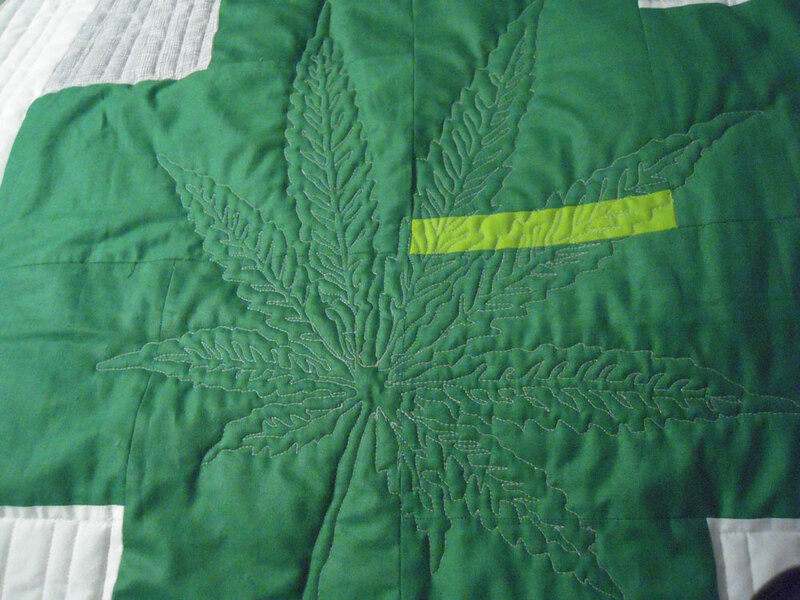 On the quilting front, I finished my #cannabis pillows! I think they came out great! This is the front and back of one of the pillows – they are both close to the same, a few differences to make them unique. 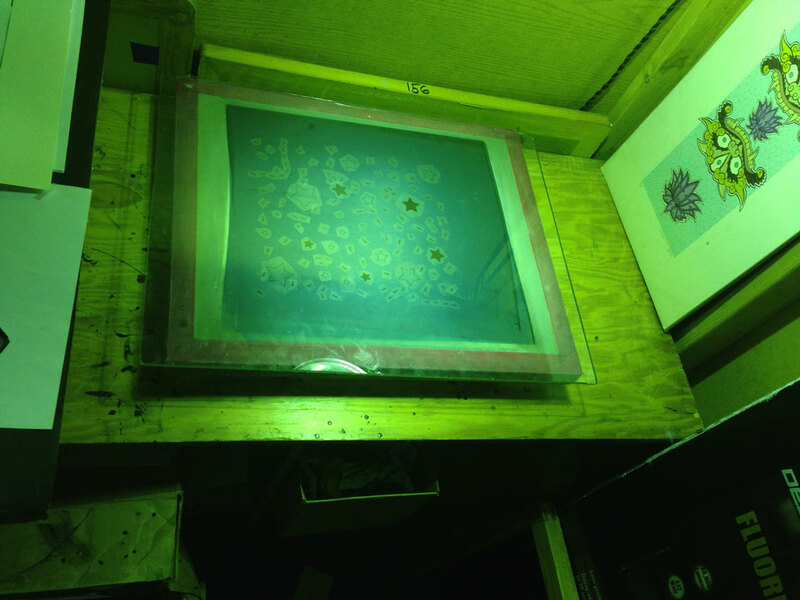 The cannabis print was done using discharge ink. 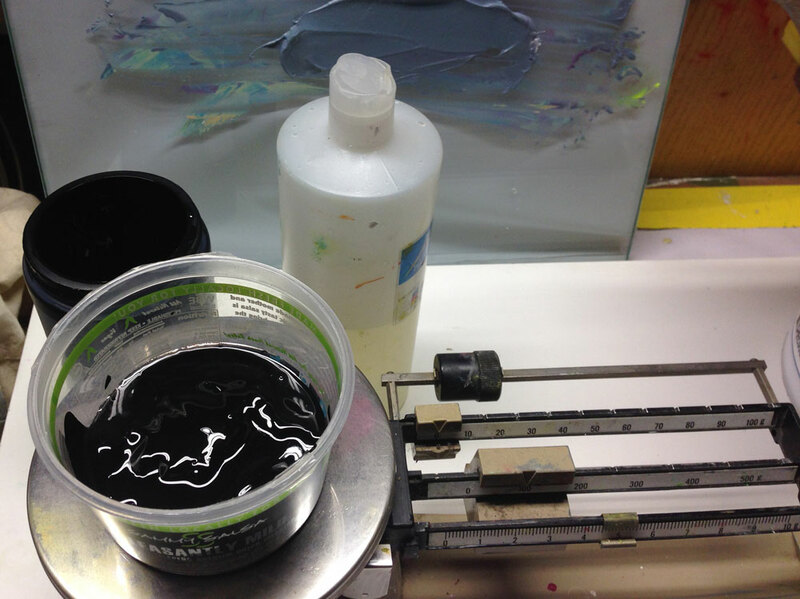 Discharge ink is actually more of a chemical reaction than an ink – it releases the dye of the fabric leaving the base fabric as the ‘print’. 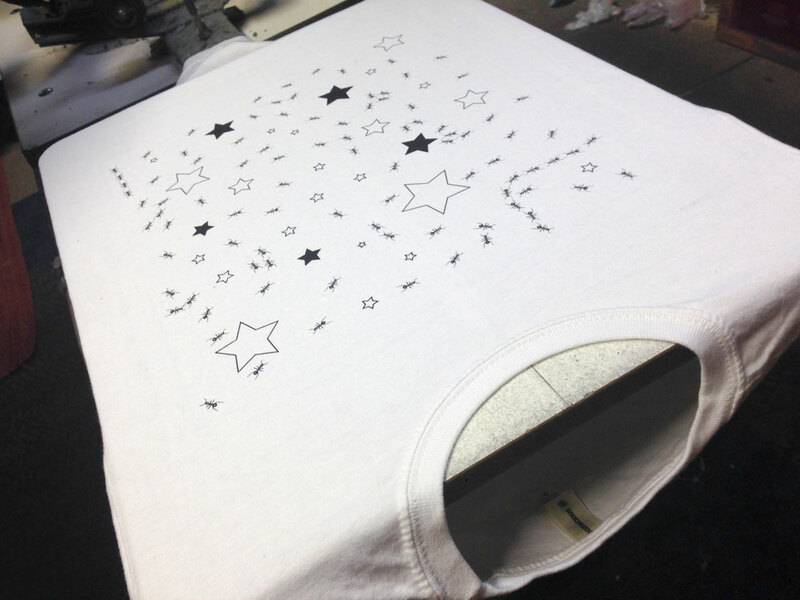 This means the print is a part of the fabric and can be ironed over and is just as soft as the fabric – no layer of ink! 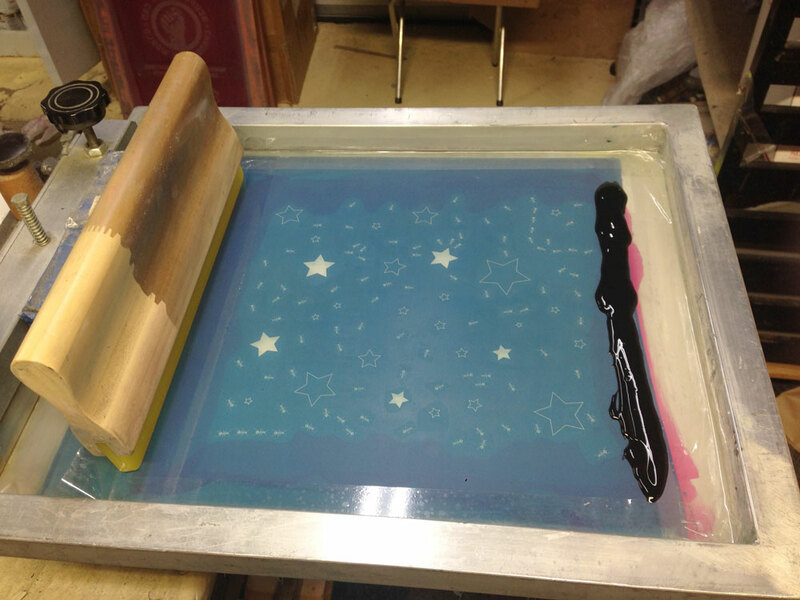 It’s a fantastic print method for fabric. 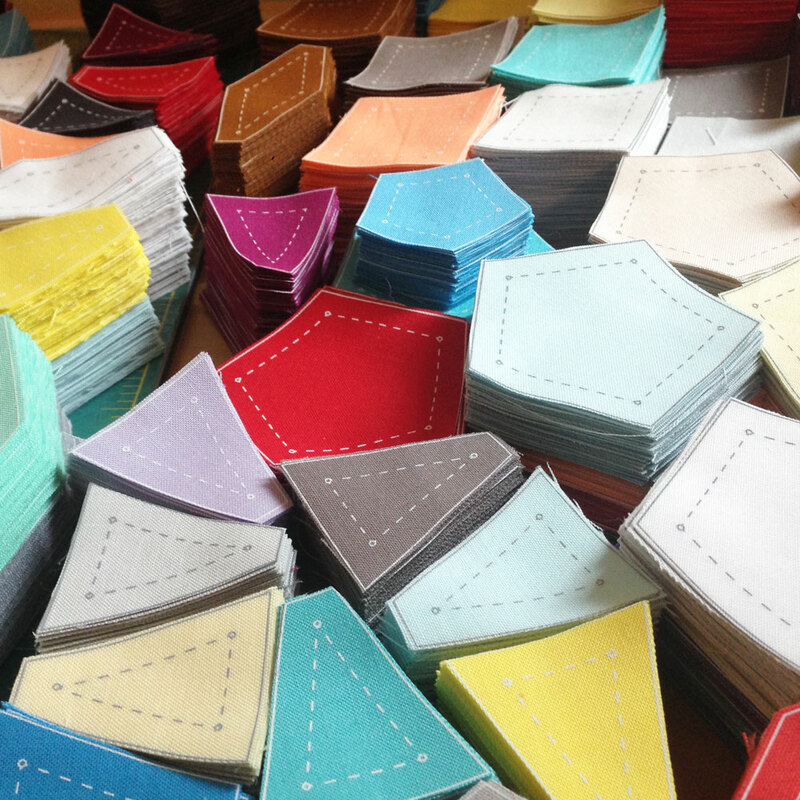 I have a few print/quilt related ideas in process right now to see which, if any, may pan out to push further. A work in progress! Oh my! What a predicament we have gotten ourselves into here in the US. I have to admit, I’ve been a little beside myself as to how to move forward in a positive light. Luckily, I have great friends and family! One of my friends recently wrote this statement on FB and I loved it – so much, that I designed a shirt based on it! 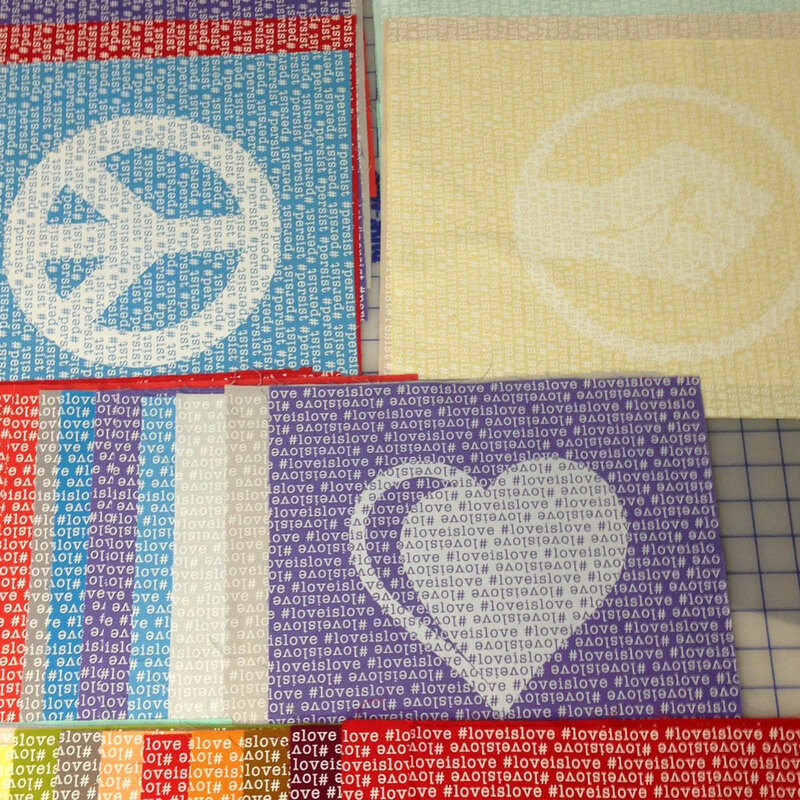 This one I made specifically for my quilty friends… at least the ones who are all about human rights for all human beings. 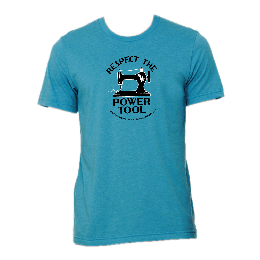 We set Feb. 22nd as our print date and we’re taking pre-orders until Feb 15 for T-shirts, Ladies T’s, and Hoodies. If you’re interested, here’s a link. We are having some weather here in the Pacific NW – we’ve had more snow here than I can ever remember, and this week it stayed cold, so it stuck around – and now icy rain is falling over the snowpack. This city is not prepared for snow, and neither are most people who live here! I grew up in Minnesota and learned how to drive on a frozen lake, so driving on icy roads comes pretty natural to me… but I highly doubt others on the road have such experience. So I’ve been staying indoors and doing a lot of paperwork (end of year accounting) and brainstorming. 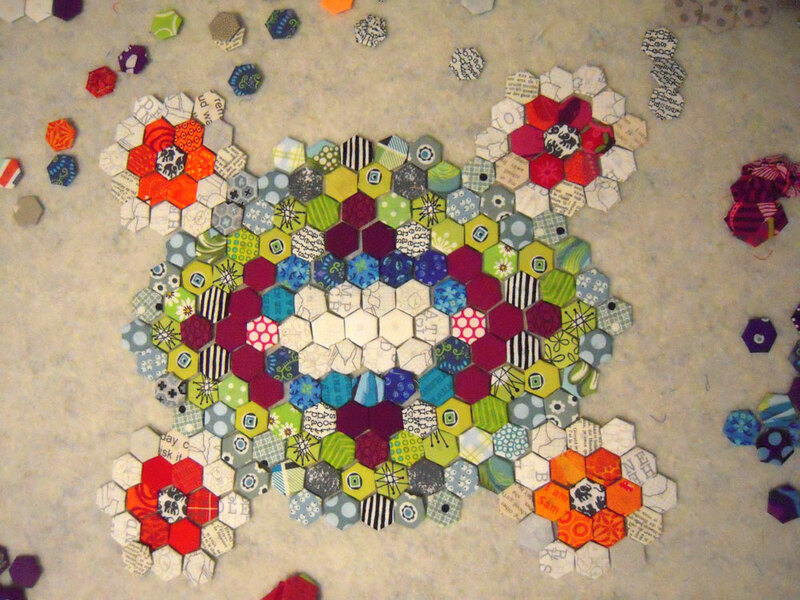 I’m brainstorming ideas for quilts and other projects for the year. 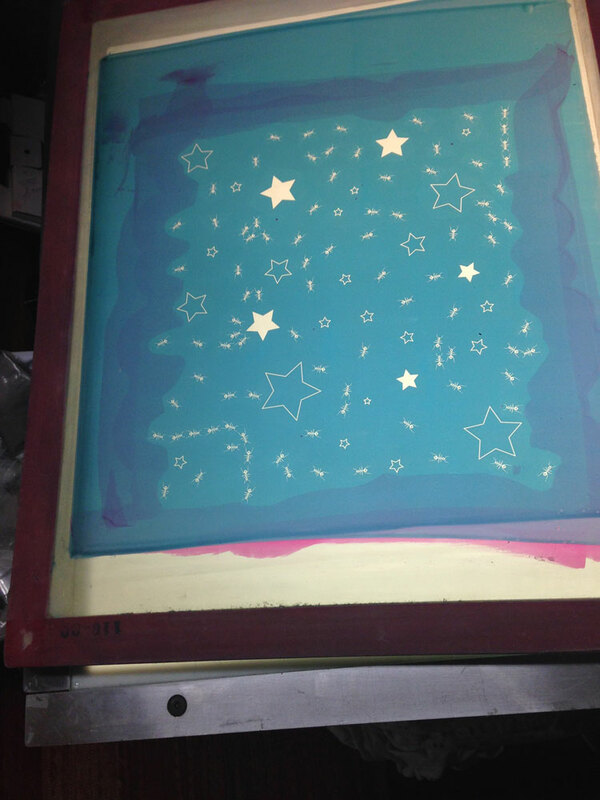 One thing I really want to re-visit is printing on quilts. Gregg and I worked on this quilt together a couple years ago and I love it more and more as time passes and it’s becoming more used. 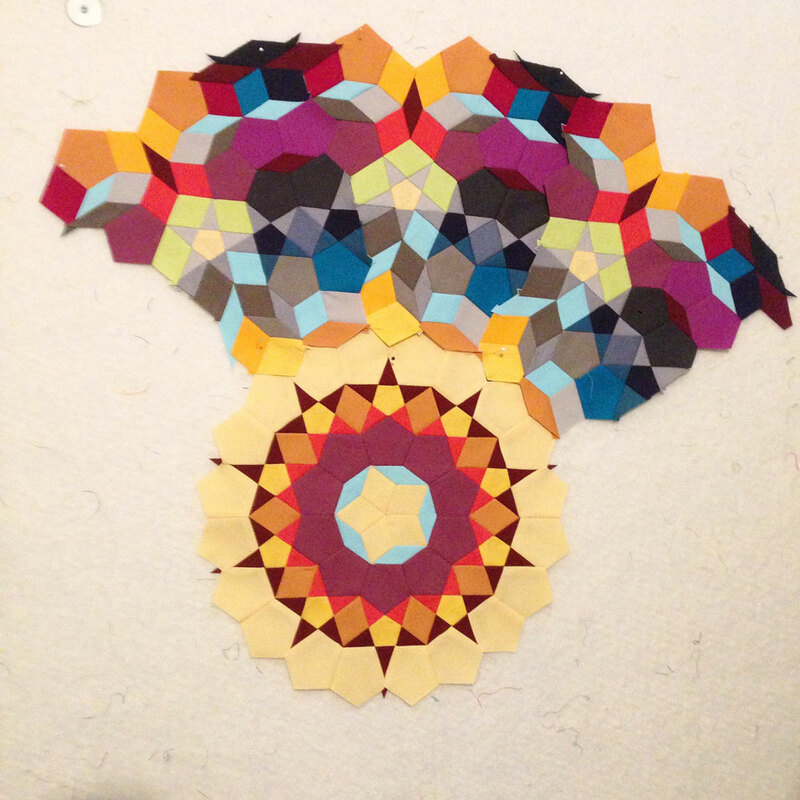 I also want to follow through and make all the chakra quilts! So many ideas… I hope I can process them all. My camera and my computer are currently not speaking to each other so I haven’t been able to access new photos here in my blog. It’s a little irritating, and part of the reason I haven’t posted much lately – but it will be remedied as soon as I get my new computer! It’s snowing again in Portland! It’s a bit rare that it actually accumulates, but when it does (like last week), everything sort of shuts down around here. The roads get very icy and there are a lot of curves and hills that can be treacherous. Luckily, I just got back from a dental appointment just ahead of this upcoming storm. I received some unfortunate news about my teeth. 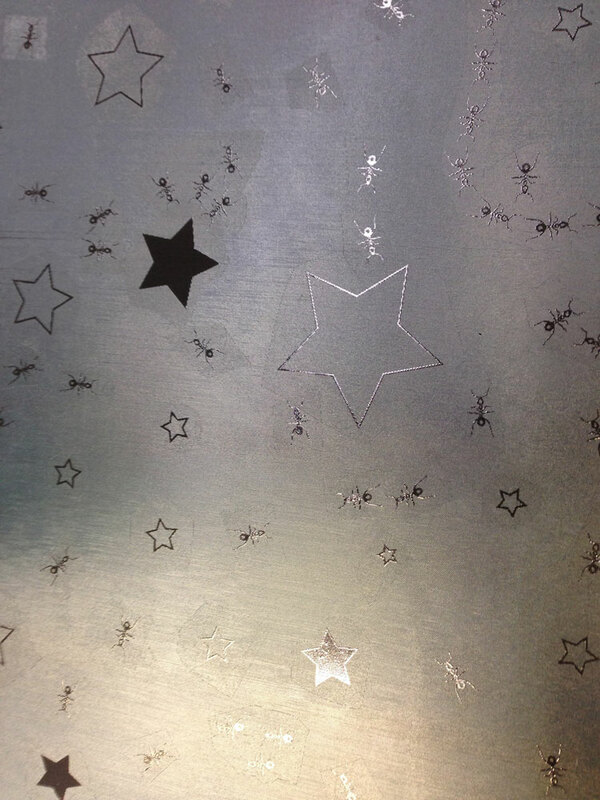 So far there are 3 crowns that have become ‘dis-adhered’ and will need to be replaced. I also have one little cavity. The crowns are what get me a little upset because they are all new – like within the last 2 years… and they are not cheap! So, before they replace the crowns (for a 3rd time) they plan on doing some resin mold or casting of my teeth to check my bite and to see if my TMJ has become degenerative. If it is, it may be affecting my bite and causing certain areas to hit too hard, and it will need to be addressed before new work is done. I am now thinking of a way to make extra funds to cover this dental work. 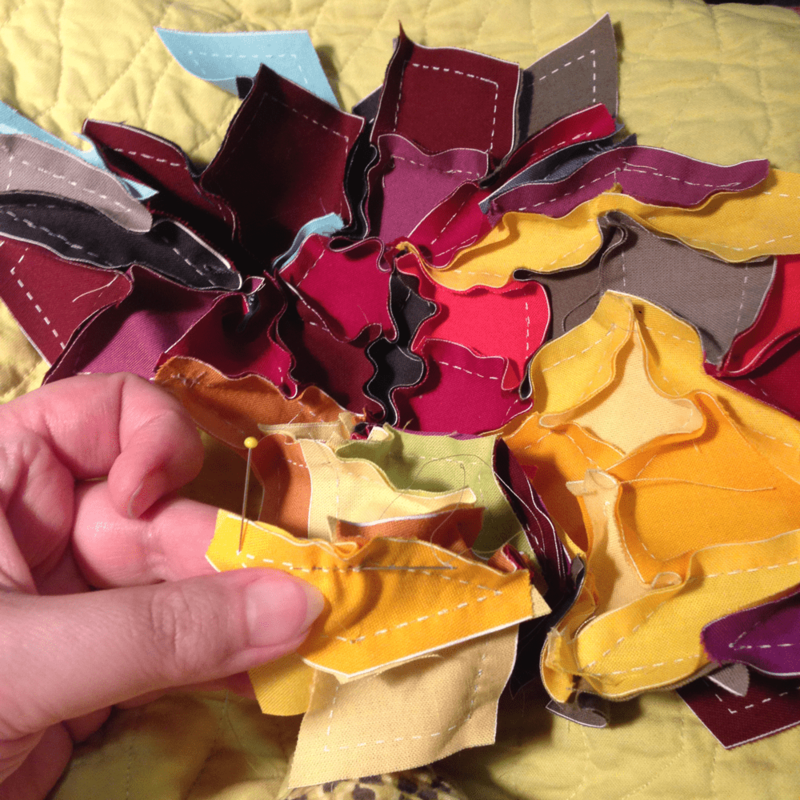 I’m starting to consider what I can do in the quilting world that can garner that kind of cash… and I don’t think there are many avenues open there – but I haven’t really tried anything either 😉 Going to put my head into brainstorming mode… maybe I’ll have an idea by the end of this 31 Day Blog Challenge! I’m also just going to put this out there into the universe… you never know who might have the perfect temporary project for me! 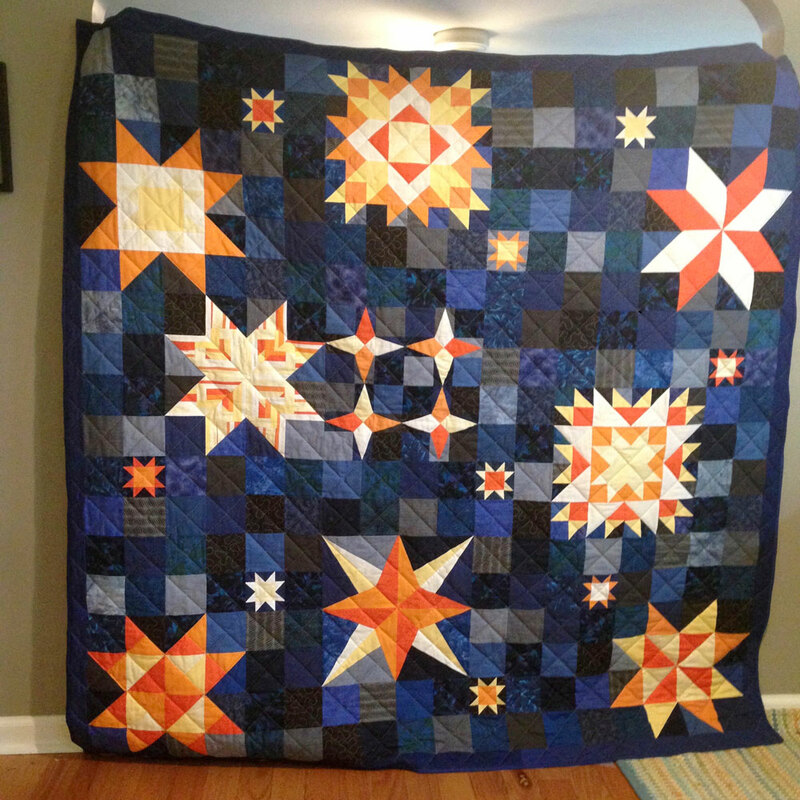 For your viewing pleasure today, I’m re-sharing a quilt I made for one of my closest friends in 2012. 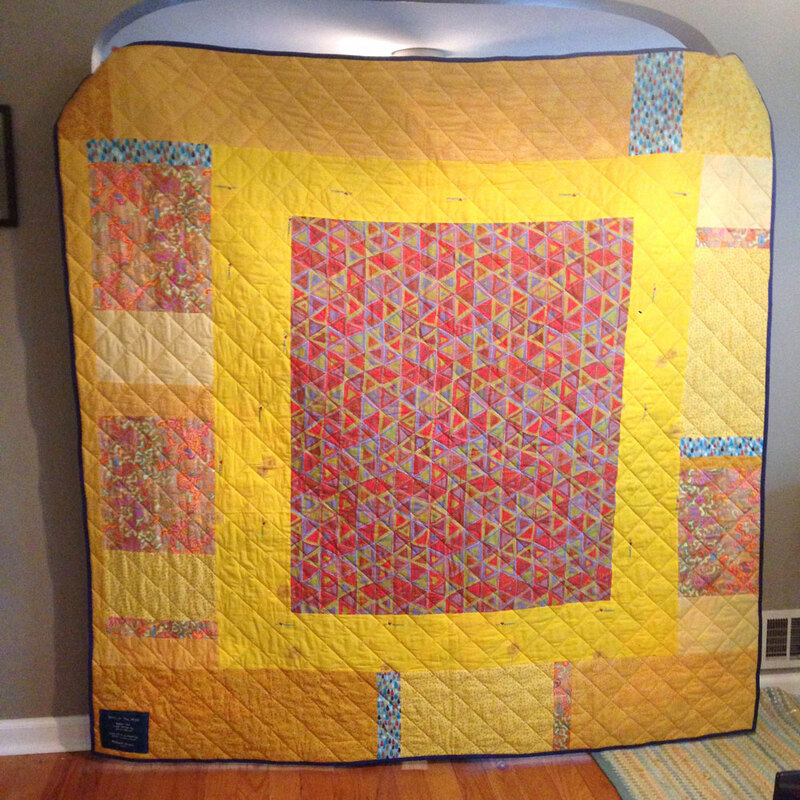 It’s a string quilt and it’s bright and sunny to offset this snowy grey day! It rarely snows here, and of course it snowed the same day my in-laws arrived from New York! It’s making the visit a bit interesting, and just a little difficult to make plans. My brother-in-law and family are also in town visiting, so we have a houseful! 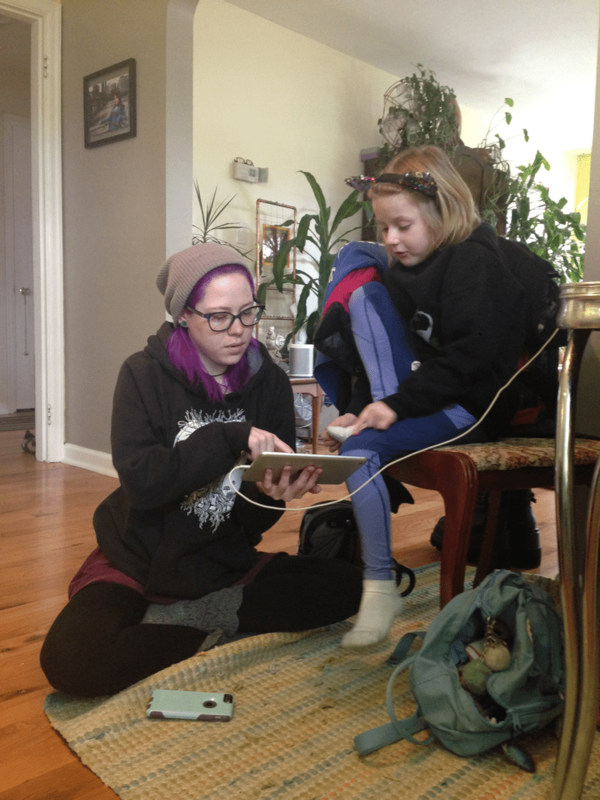 The snow turned to a big sheet of ice pretty quickly, so we’ve had to resort to indoor play. Luckily my husband is like a big kid and has never shed the toys, so we have Lego’s and board games, Matchbox cars and tracks, as well as coloring books and markers. It all came out and we’ve been having fun with the nephews! The sun is out today and everything is melting. We still have 2 days with the family before they leave town, so I’m off to enjoy a slushy walk in the sunshine, then it’s off to find an early dinner. 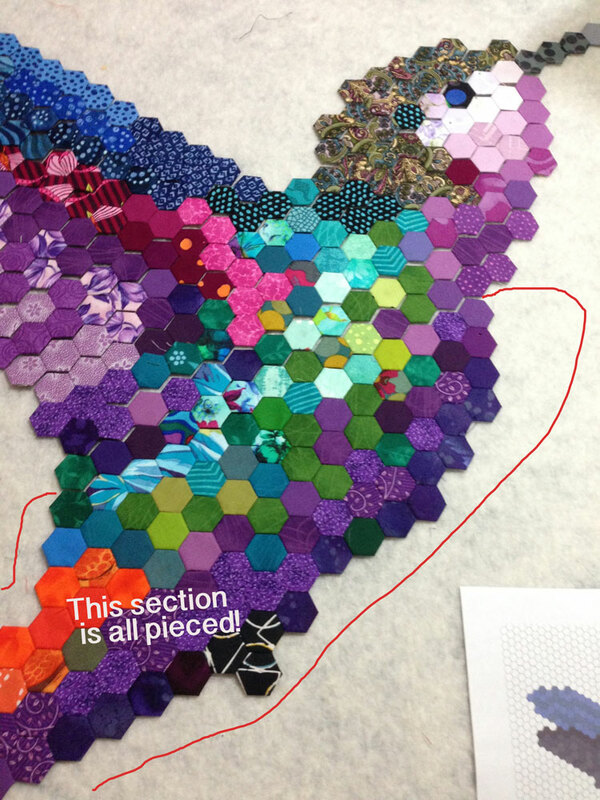 I’m steadily making progress on my Hexie Hummingbird! Currently, I’m stitching the rows to each other. 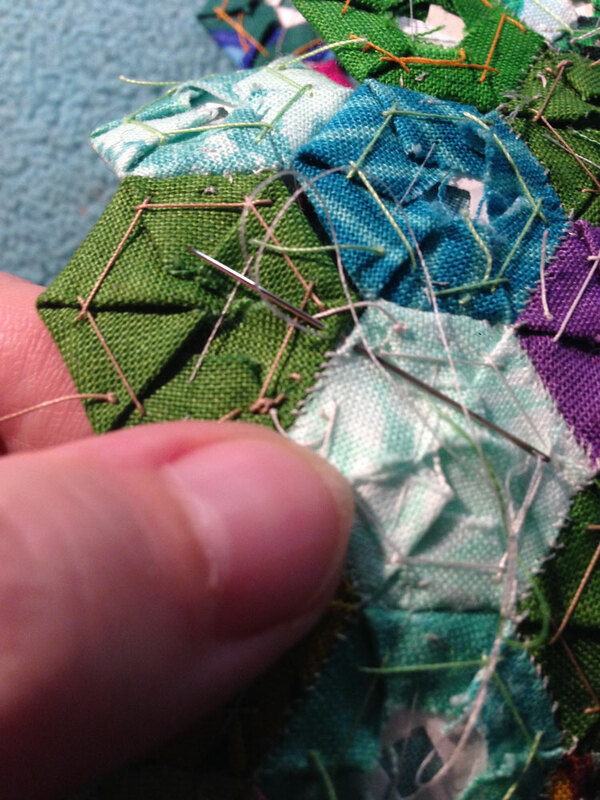 While I make the rows using a ladder stitch, I change it up when I’m sewing the rows together and use a whipstitch. 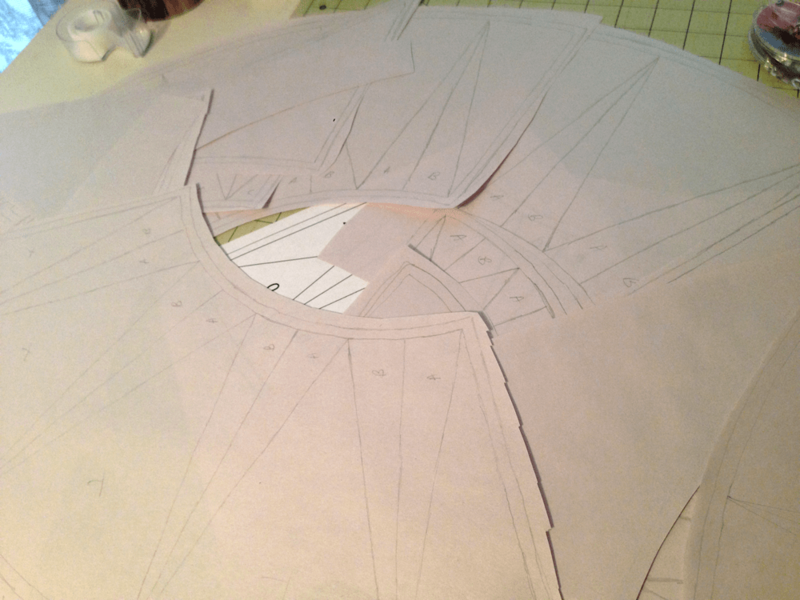 I think it’s easier to work as a flat piece when the rows are coming together. The blue fuzzy thing I’m working on is a stuffed animal in the shape of a bolster pillow. 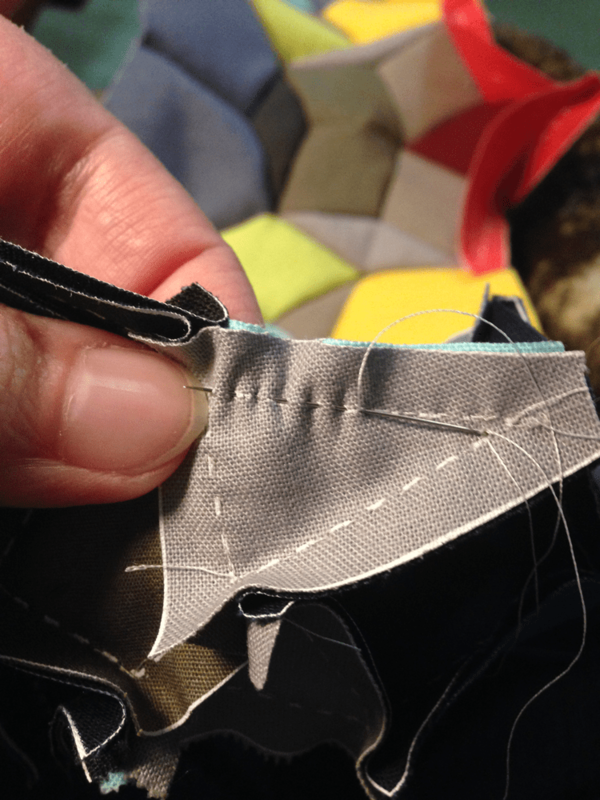 I find by using this pillow on my lap while sewing, it helps me keep the piece flat while working on it, I can see my stitching better, and sew with less stress on my wrist… I can also wrap it around the pillow as it gets larger. 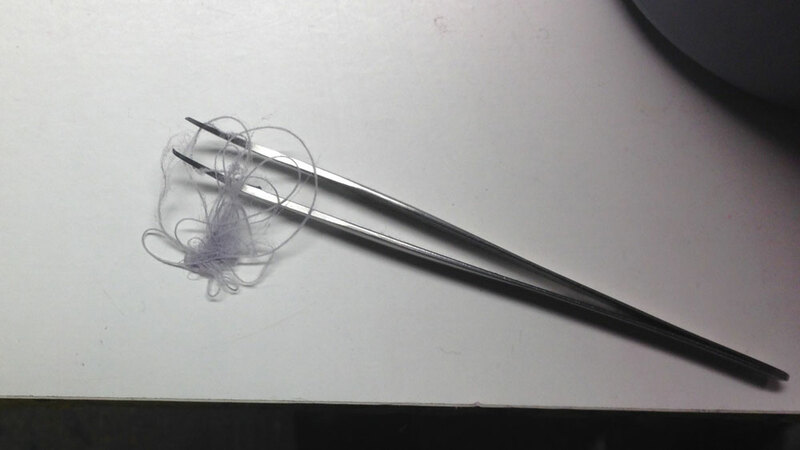 I’m testing a fine silk thread as a double strand right now. Usually I use an all purpose thread, and that can be used as a single strand. I’m still undecided as to which way I like better. So this is my progress! 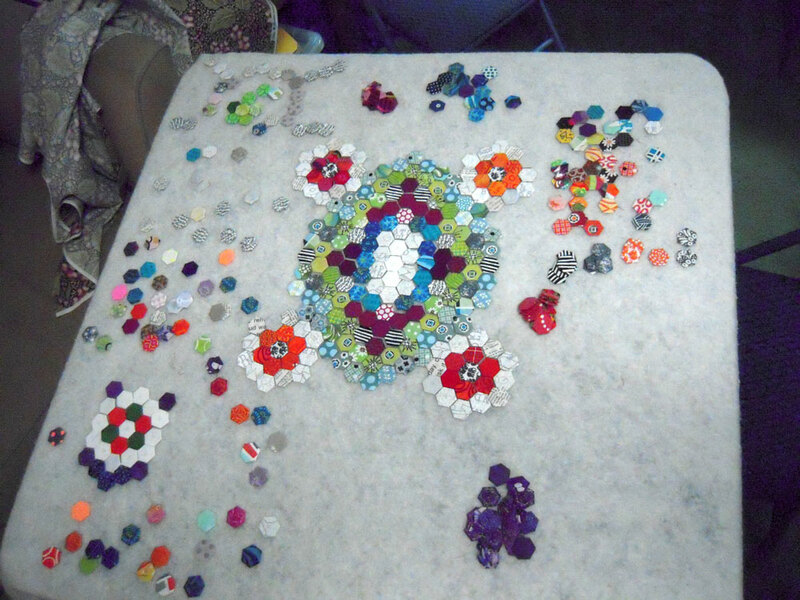 I’m looking forward to the appliqué process – it will be a new thing to try for me! 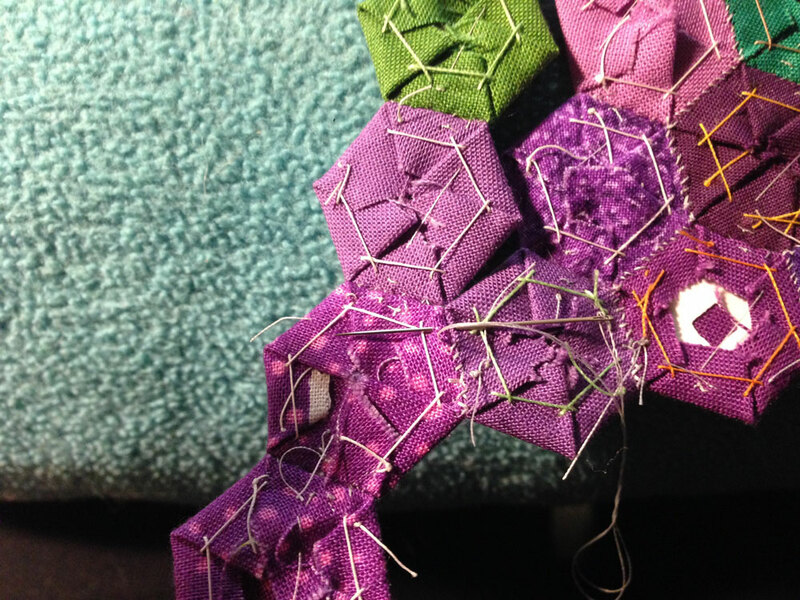 I just love how quickly this project is going – and it’s because I didn’t do a full hexie background. Food for thought! 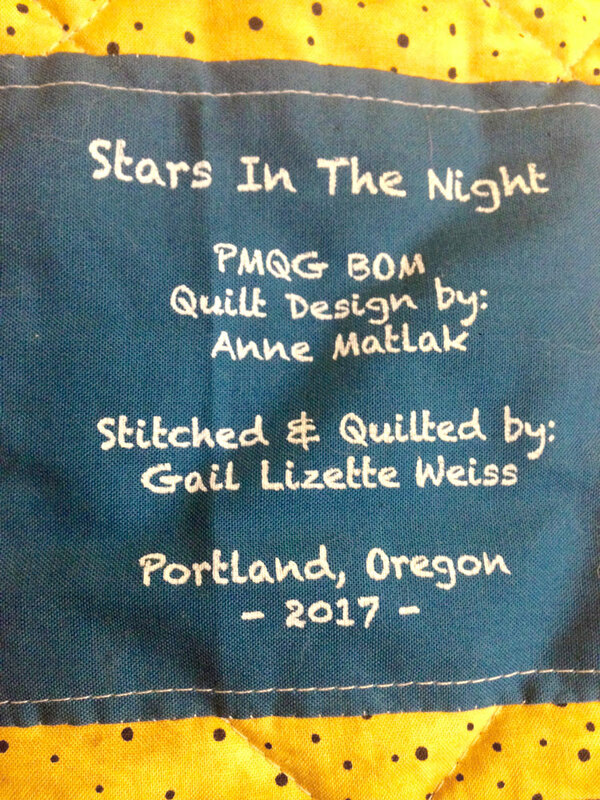 Tonight is the PMQG meeting, and they’re having a mini-trunk show of all the quilters who had quilts show in the PMQG section of the Sisters Outdoor Quilt Show. 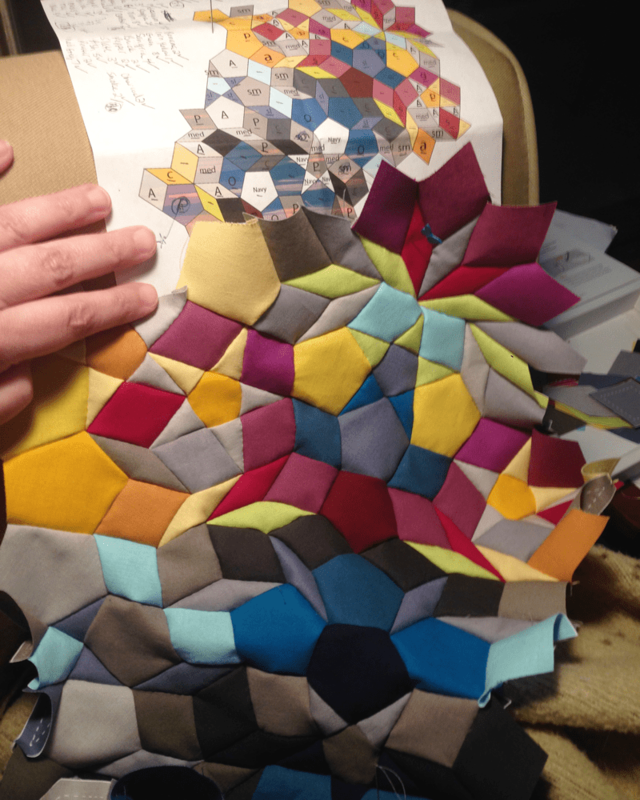 Since I’m in that group, I’ll be bringing some quilts to show tonight, even my hexie quilts! 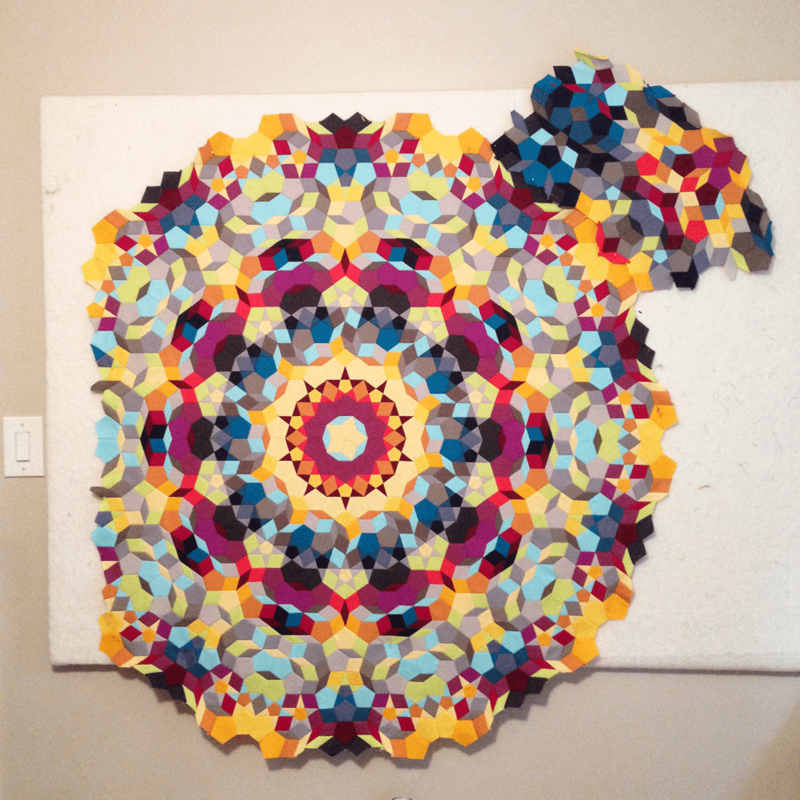 I’m a little nervous, but really excited to be able to share my quilts again! Big Anniversary… a personal story. It’s 1996, I’m working as a bartender, and my daughter had just started kindergarten. The two of us had been living in a van for 2 years, and I had worked hard to get myself into a 1 bedroom apartment about a month prior. As soon as I had set up a telephone line, I started receiving calls from creditors. This confused me, I had no credit… not even a bank account at that time. I had been homeless, waiting tables or spare changing for money – I definitely did not have a checking account for any said check to bounce. I didn’t know what was going on until I remembered my storage locker that had been broken into the year before. I didn’t think of it till just then, but among all the things I lost (everything I owned) there was a briefcase that had all of our important paperwork in it. Things like our SS cards, birth certificates, old ID’s… even some of my old resumés… all this, along with the loss of all my photos and artwork, I felt like these thieves had more proof of being me than I did. All I could do was hang up the phone on the many creditors who called… eventually I just didn’t answer it anymore. I didn’t know what to do. Then one day, while working at a bar here in SE Portland, the police came and arrested me on the spot. They said it was for failing to show up to a court date – of which I had no clue – so I was handcuffed in front of everyone I worked with, and all the people who had come in for drinks. I was dumbfounded, but what could I do? When we got to the police station downtown, I used my one call to call my apartment manager to ask if she would pick up and watch my daughter after school – that was the only thing I was thinking about: What will happen if I’m not there for my daughter?? I didn’t even know why I was being arrested… I had no support system, family or otherwise. What would happen to her if something happened to me? 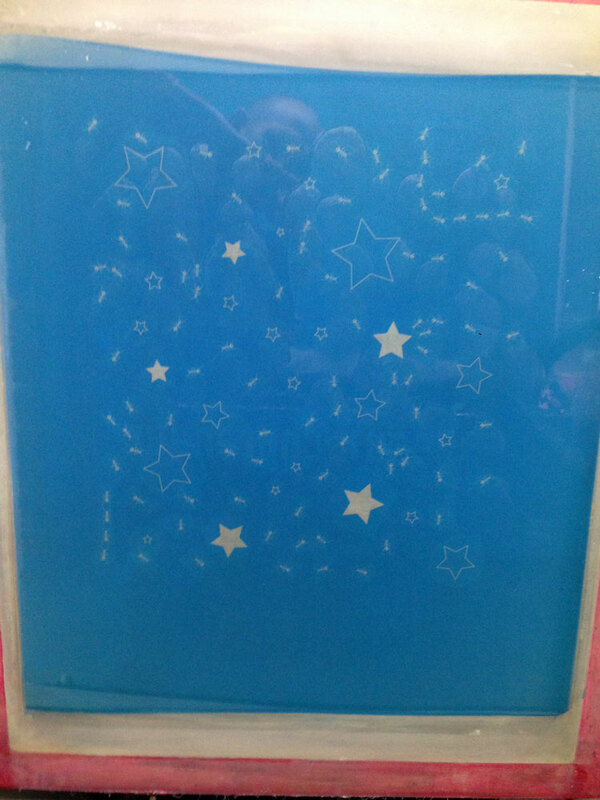 I stayed in a holding cell for a bit, then I was fingerprinted and was being processed to go to jail. As this was all unfolding, a detective came up to us and let me know that my fingerprints did NOT match the ones they had on file. There was quite a bit of confusion, but after a few hours it came to light that my identity had been sold at the same time the DMV computers were being updated, and somehow there were 11 different photos to my name. Many of these ladies had used their forged ID’s to steal things, some created checking accounts and credit card accounts, others opened accounts with electric and gas companies. One got a warning for defecating on a car (yuck! )… and one got caught with a half pound of meth in a truck her boyfriend was driving, a truck full of stereo equipment recently purchased using a check under my name. SHE was the one who didn’t show up to her court date- and when they searched for her, they found and arrested me instead. This all sounds terrible, and it was, but luckily, this woman had been fingerprinted and they didn’t match mine! Now I finally had some proof of fraud to battle the creditors with. It still wasn’t easy, for every credit notice I wanted to debate, I had to send a copy of a letter from the District Attorney describing the fraud with a copy of my fingerprints, pics of my tattoos and new ID, along with a handwriting copy that had to be witnessed by a registrar and stamped – it was one big packet of info, and I had to send out a packet about 3 times a week. This was a bigger expense than you’d think. At the same time I was subpoenaed to go to court, as a witness, a couple times a week the whole time this girl and her boyfriend were tried for fraud and meth possession. The courthouse was way out in the suburbs, and I had to go by bus because I didn’t have a car at the time. 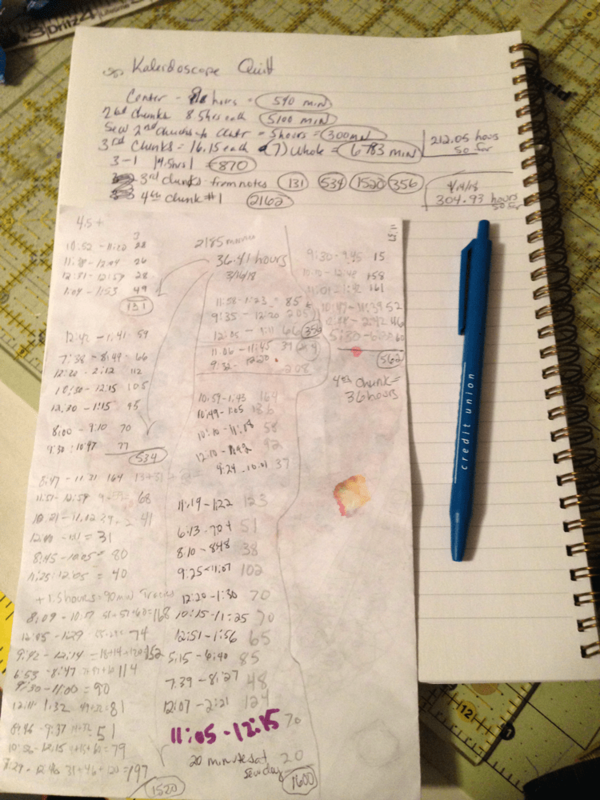 Between that, a half-day kindergarten schedule, and my bartending schedule, I really felt beat – totally exhausted. That was a rough period of time, and I was using drugs and alcohol to get through it. I met my husband during this time, and it was with his help that I was able to stop drinking and using. I couldn’t get a bank account or any credit for years… and even for a while, I had to have a manager from work come with me to cash my checks. It made getting married and changing my surname so much more appealing! So… this year is the big 20th anniversary of having my fingerprints taken and having my name cleared of so many terrible things. … AND it marks 20 years of being completely off hard drugs and cigarettes, and 20 years being with my husband (12 years married)! 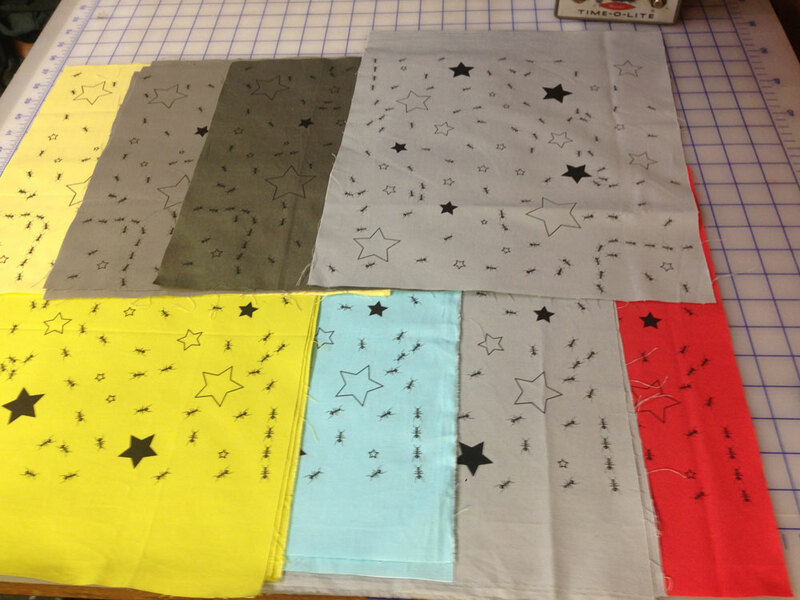 YIPPEEEEE – I think it gives me reason to celebrate, and as you may know, I now celebrate with fabric and thread! 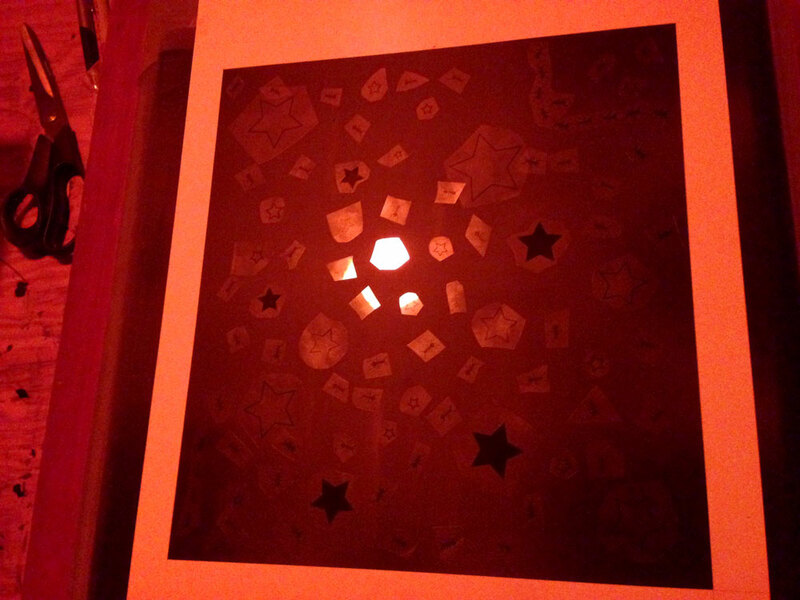 This one is called: Earth Energy. 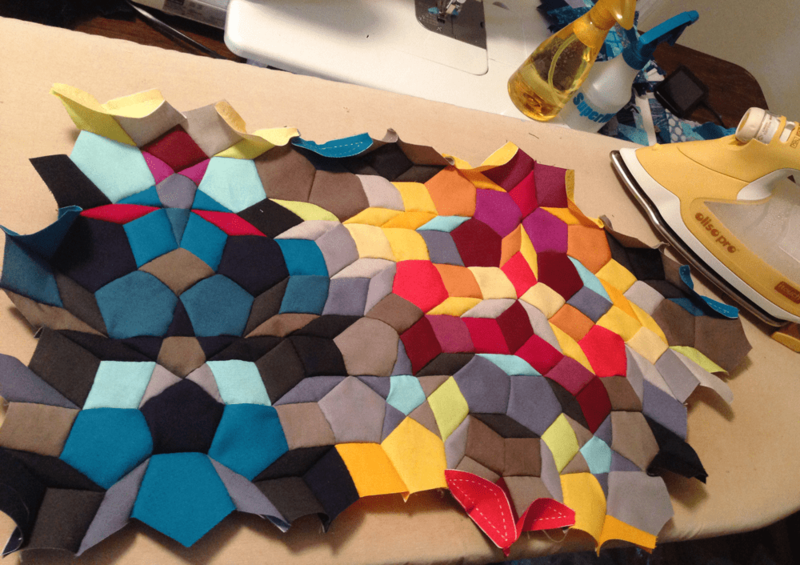 This quilt came about because I won a pack of pre-cut off-white Kona HST’s at PMQG meeting a year or two ago… then, when I was at an All-Day-Sew, my friend Beth Wells was getting rid of some of her stash, and she happened to have the Kona Darks HST package – and gave it to me. I was pretty excited, but wasn’t sure how to put them all together at first. 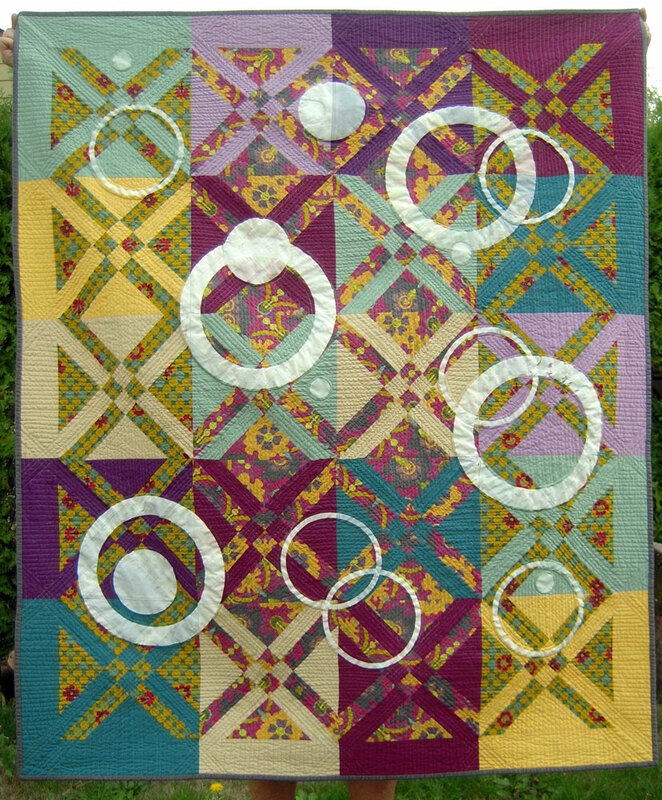 I ended up with a ‘rainbow’ type quilt, and it reminded me of radiating energy, hence the name. 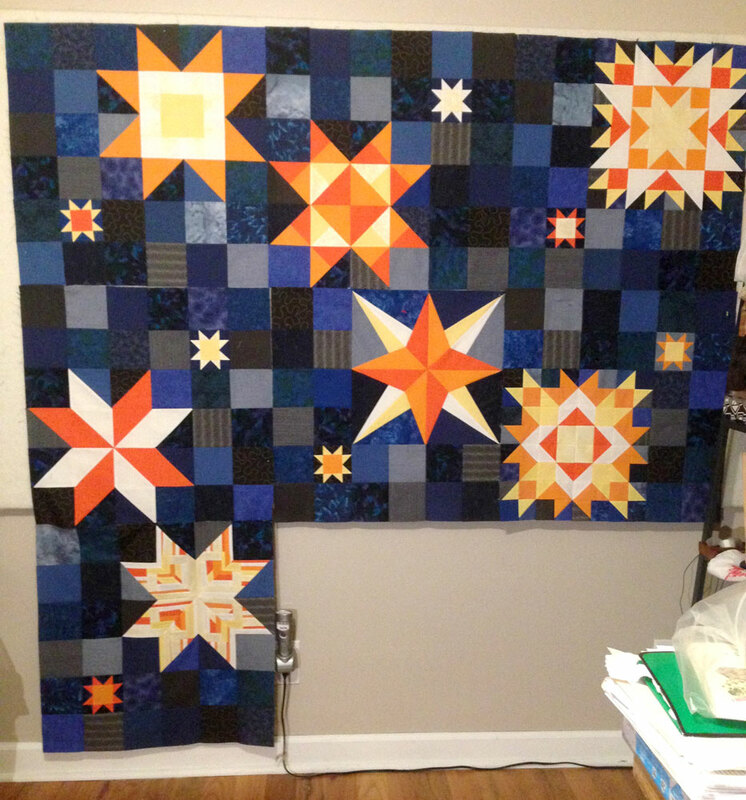 Once the top was finished, I wanted to quit it on my Juki, but didn’t have a good idea of HOW I wanted to quilt it. I started with the wavy lines and after I was done, I was ready to pull them all out and start over. 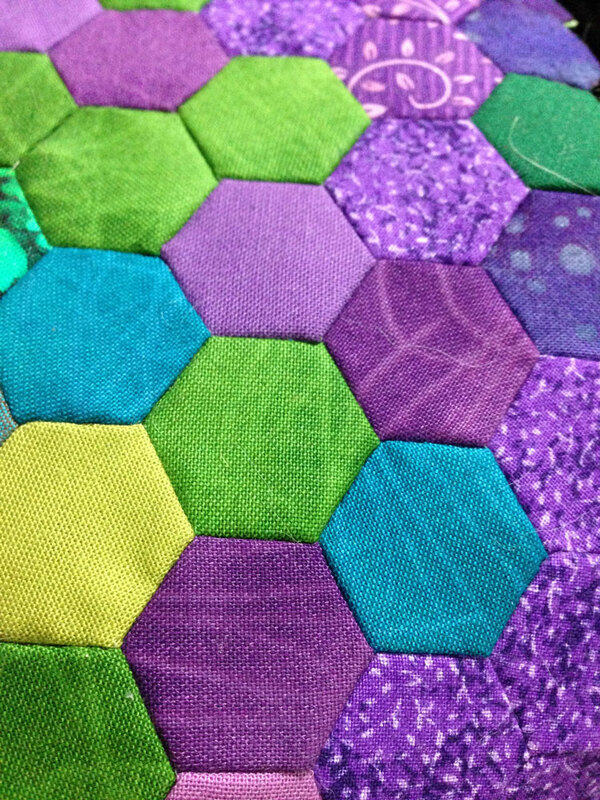 Instead, I just added more quilting using straight lines. Well… semi-straight lines, I free-motioned them, so they are definitely not perfect, but I ended up LOVING how it turned out. 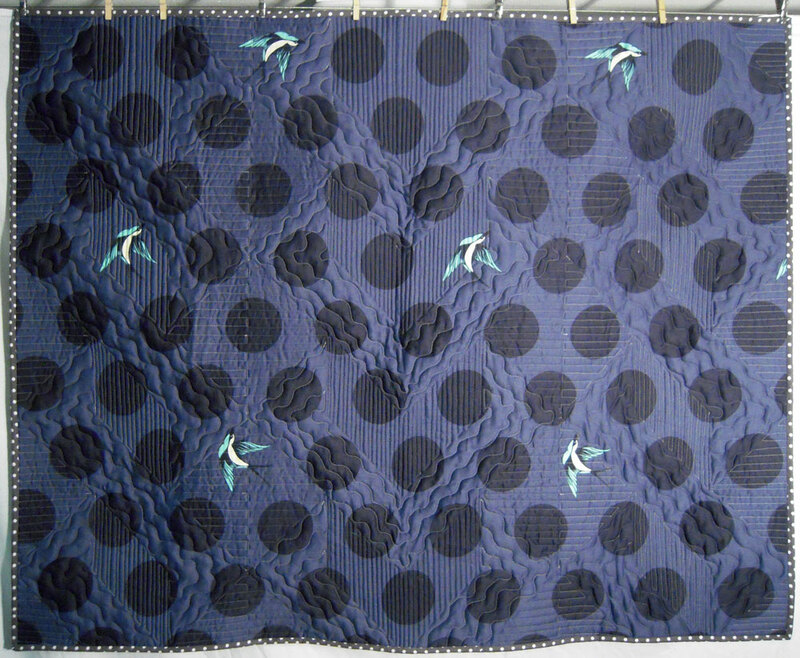 I got some of the really neat Tula Pink quilt backing in blue for the back – I adore these backing fabrics with polka dots and birds – so awesome! 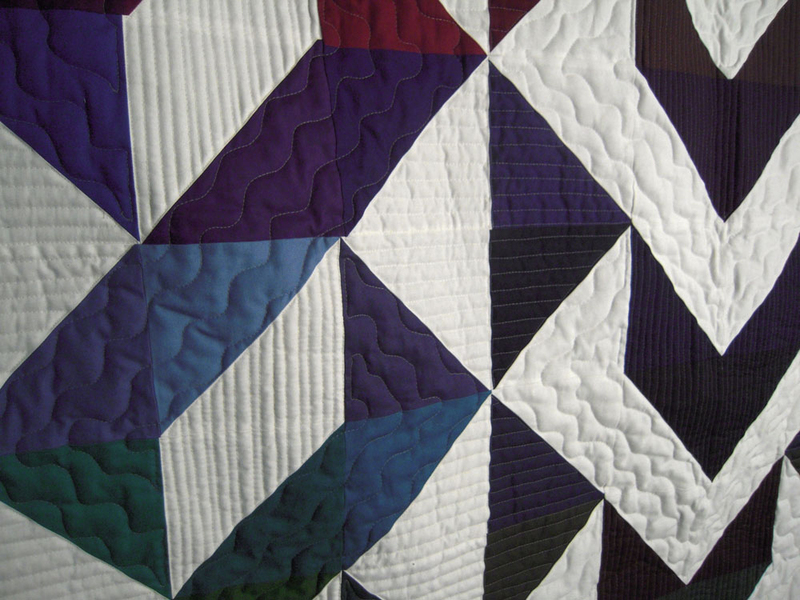 I used wool batting for this quilt too – it feels so soft… and I still have to wash it! It will feel even better after that! 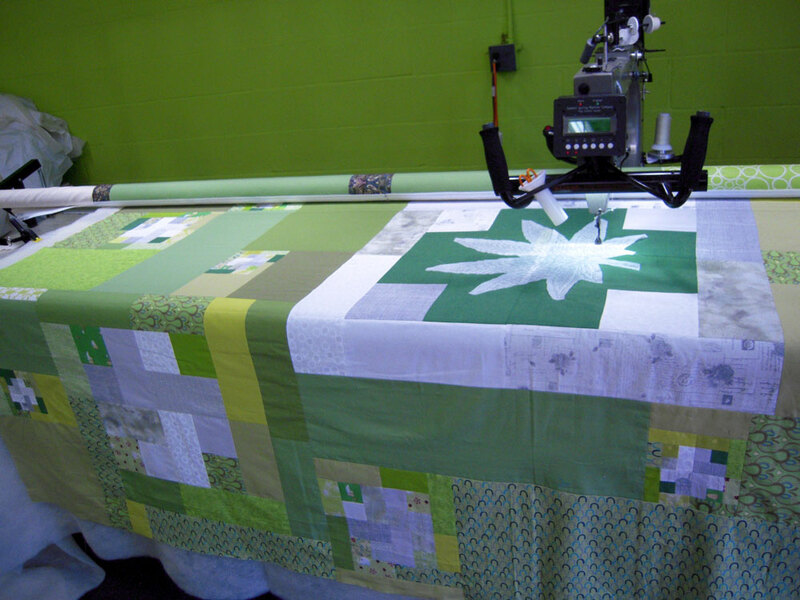 Recently I also went a little crazy with the green fabrics I have laying around… it didn’t help that I had a couple requests too… so I also finished 4 smaller cannabis quilts. 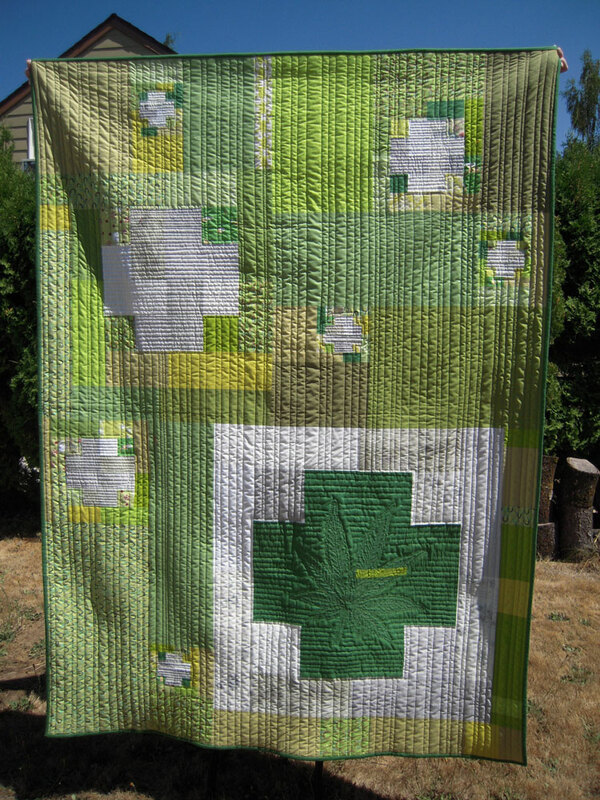 I’m calling them my “Green Cross Series Quilts”. 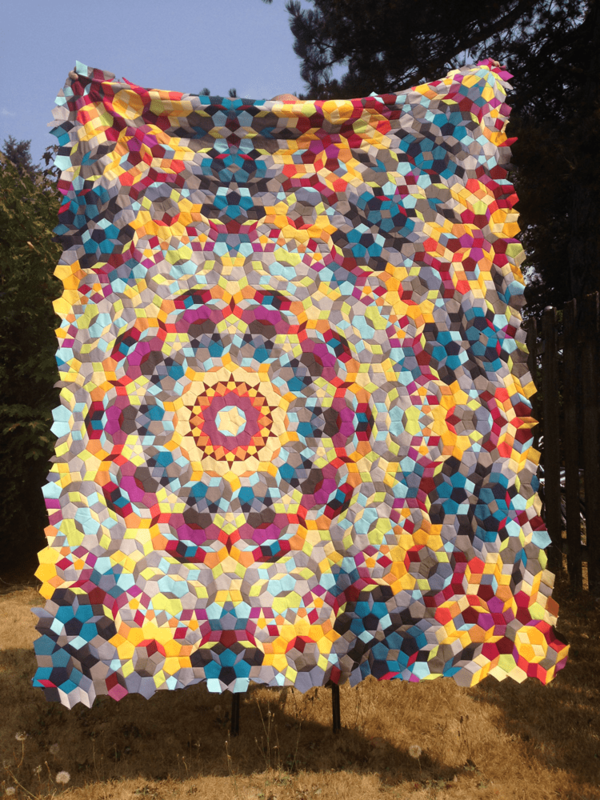 I finished the last two of these since the beginning of the year, along with the Earth Energy quilt, that makes 3 new quilt finishes for me this year – YAY! I’m so happy to share something productive! With the heat wave we have been experiencing here in Portland, it makes it seem like forever since we’ve seen rain… today there are clouds in the sky, and I am thankful! A little rain would be pretty sweet about now too. Boy, it seems like an endless summer. 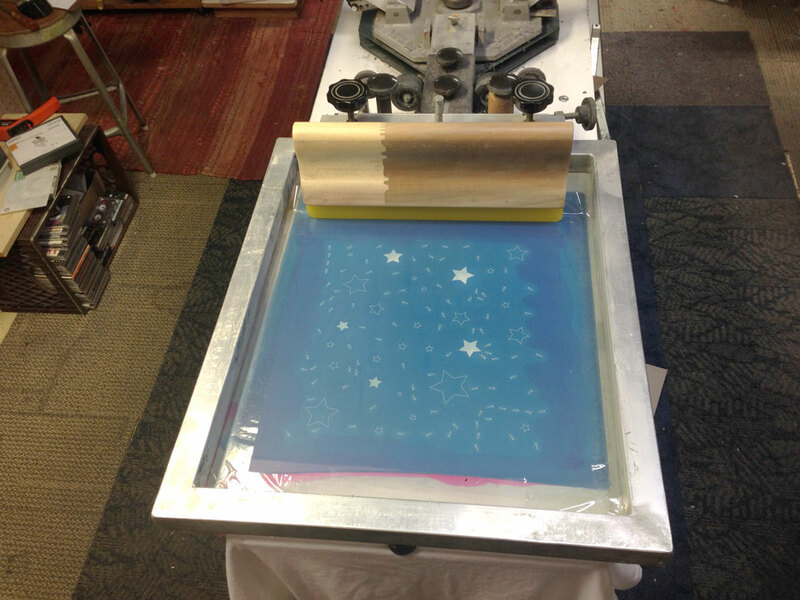 With summer comes our busiest time in our screen printing business. 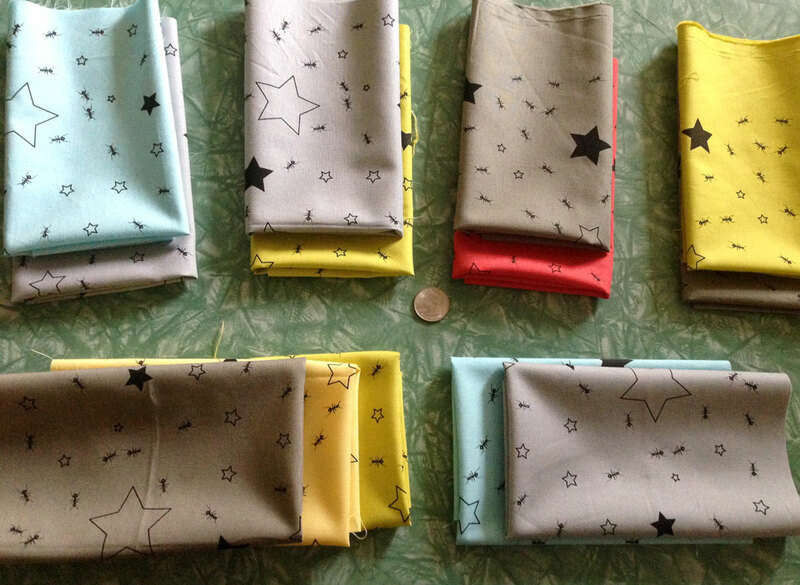 I’ve been doing a lot of design work and not much sewing – but we all need the work to pay the bills -and buy the fabric, so I’m definitely not complaining! 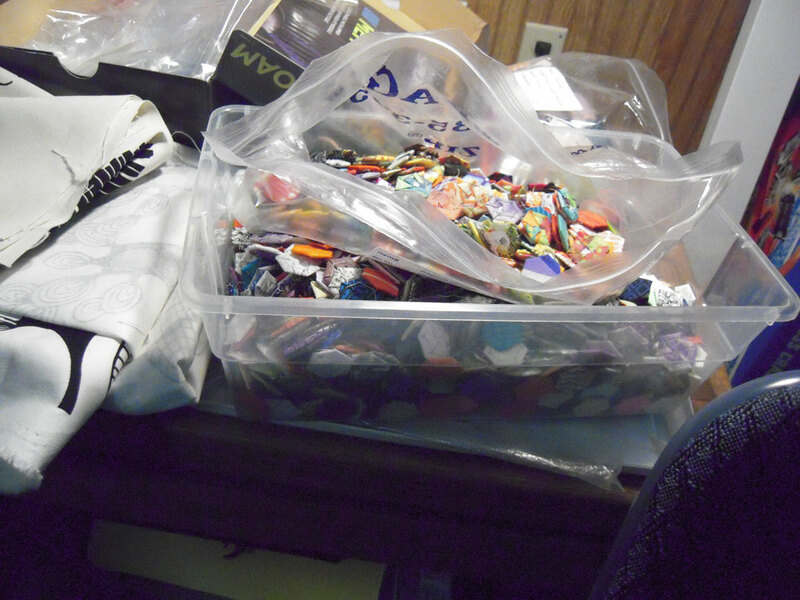 I just don’t have as much sewing to share. Doesn’t really help that I’ve been working on a small quilt for a Game of Thrones themed quilt challenge... and I can’t really post that just yet. I’m going a little nuts sitting on this one. I think it’s turning out fantastic, and I’m dying to post it! Hopefully I can share in the next month or so. 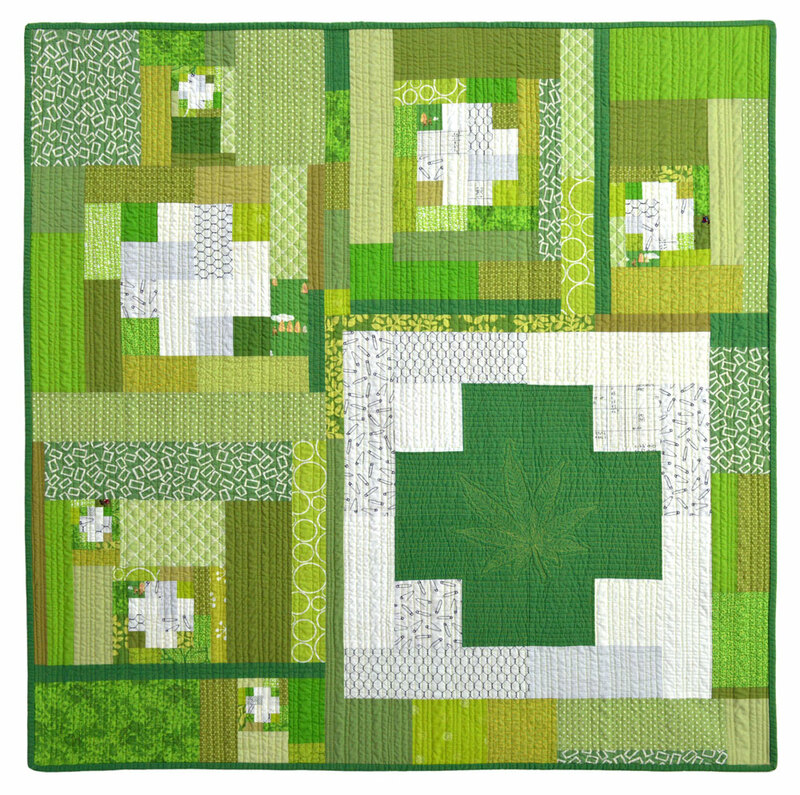 Green Cross Quilt by Gail Weiss – to commemorate the legalization of cannabis in Oregon. 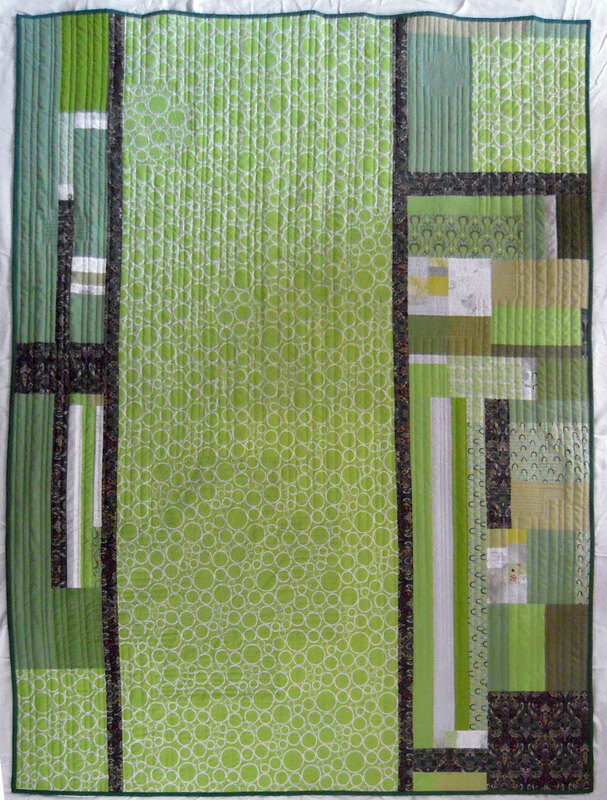 I’m entering it for the PMQG showcase at the Northwest Quilting Expo – I hope it makes the cut! 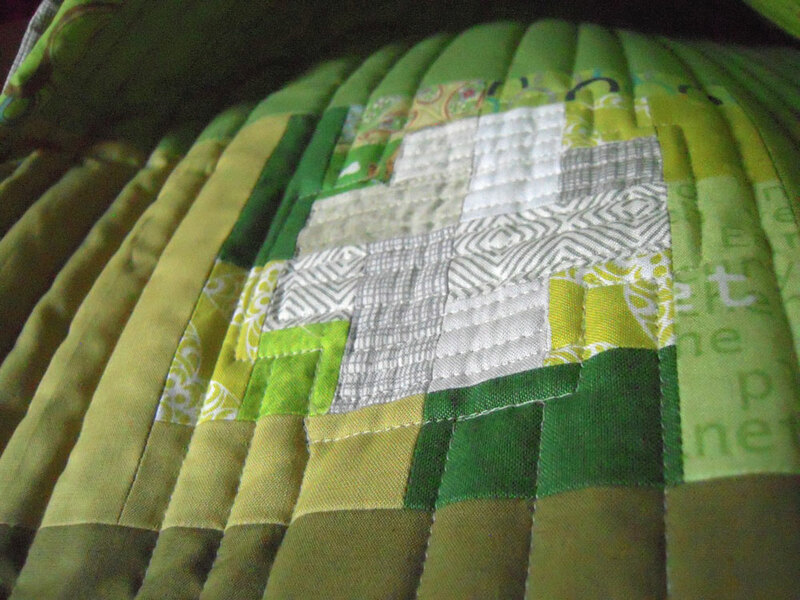 I’m really loving how this quilt turned out… specifically in the small white crosses. 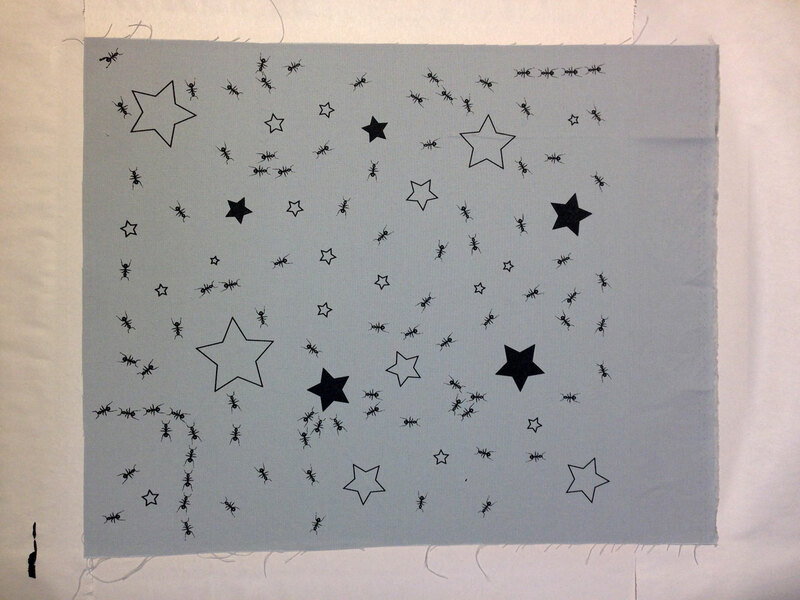 My longarm friends will understand: the channel lock on the longarm was not working in that direction, so those straight lines in the white crosses are all free-hand!! 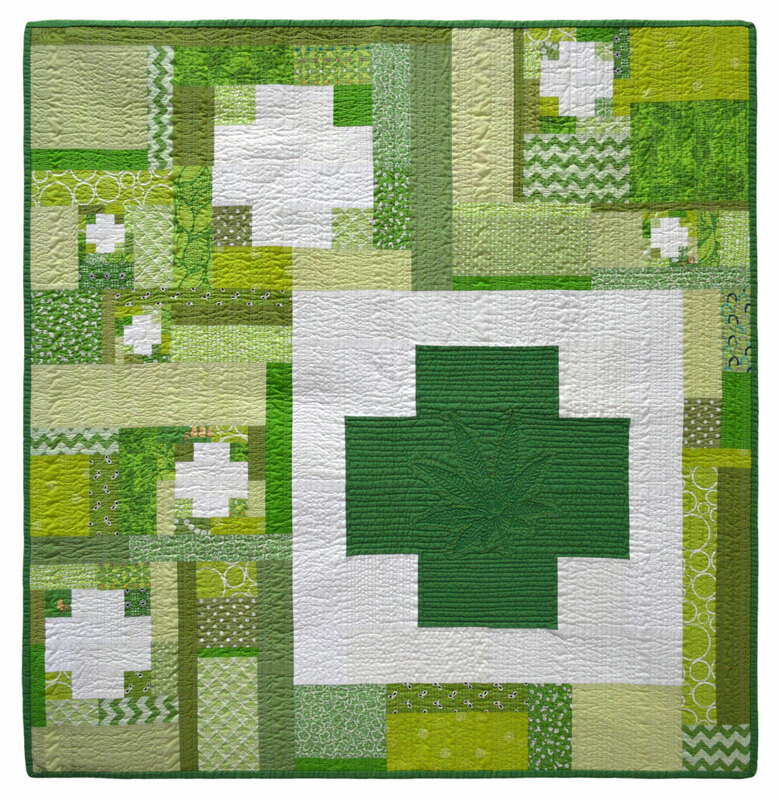 I also hand-quilted everything in the green cross section except the leaf itself. 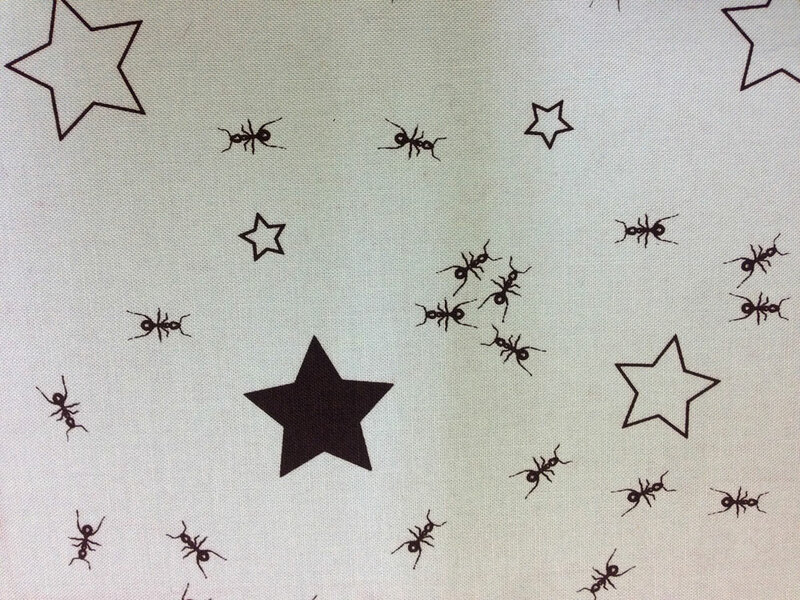 Now I’m off to do a little more sewing today before the work starts again tomorrow. The weather here in Portland has been unseasonably warm. For some reason, my body has much more inflammation issues in the heat than usual. I now have cankles, and my feet and toes look like sausages. That part isn’t so bad, it’s the sciatica (which gets ramped up with inflammation) that has been keeping me un-able to do much of anything. However, my spirits are up – on our way out to dinner the other night, Gregg spotted a folding card table and 4 matching chairs with a free sign on it – we quickly made a U-turn and now I have a ‘Hexie Play Station’! 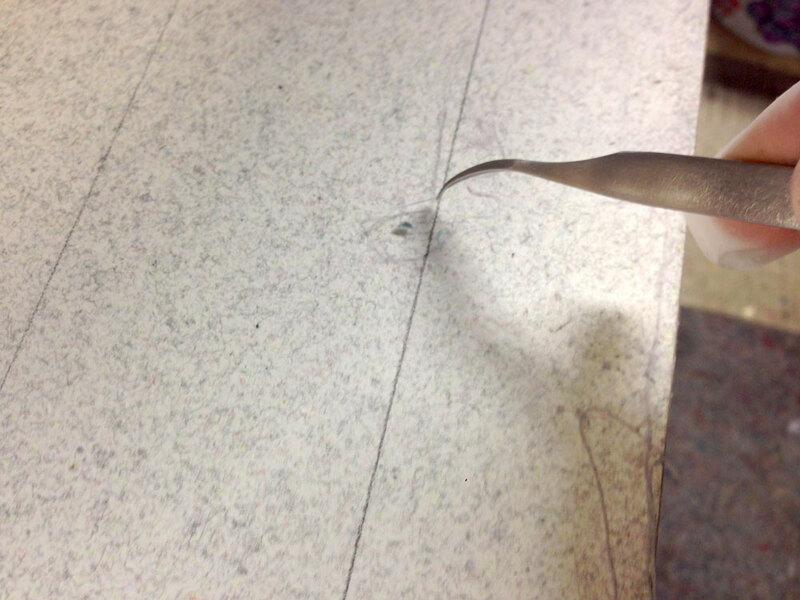 I used some masking tape to attach batting to the table top – it can easily be removed. 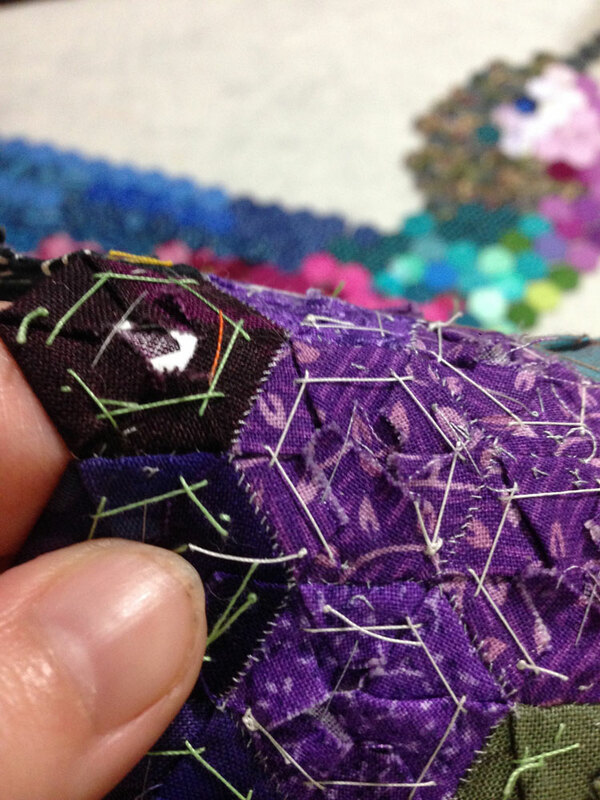 The batting really keeps the little 1/2″ hexie pieces in place… so even when Mr. Kitty jumps up there, they don’t slide around. 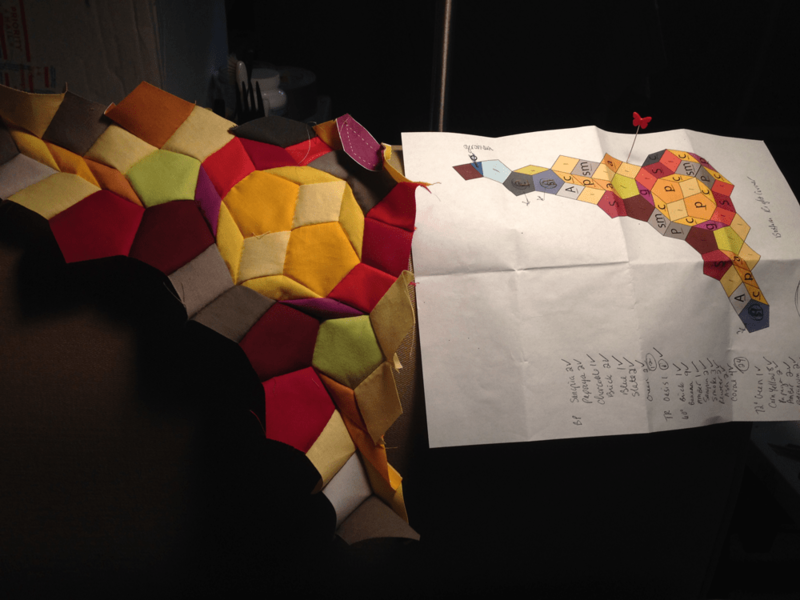 I made all the solid bright hexies from a honeybun roll – there were 41 different colors and I made 28 hexies out of each 1.5″ strip of fabric. 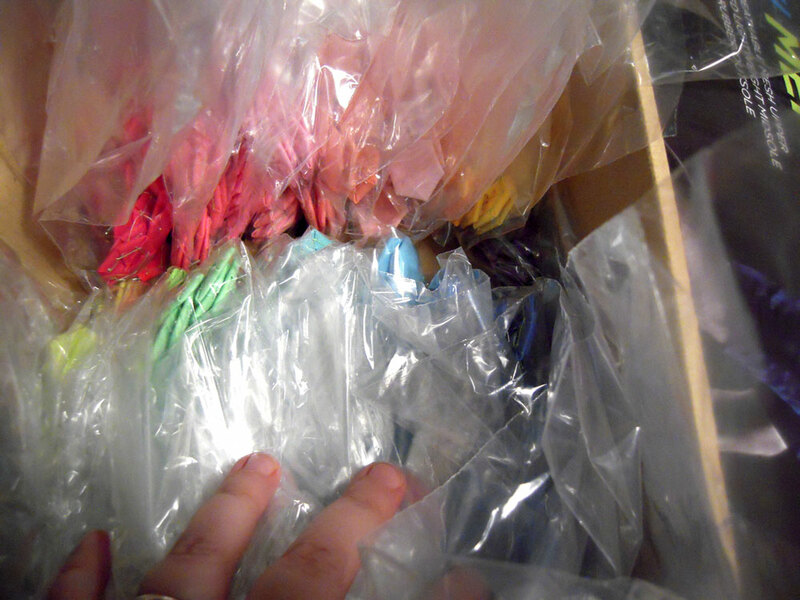 I have them all color separated in baggies for now till I figure out exactly how I want to use them. FYI: it seems to be much harder to design a layout this way… as in: not having a plan. At least it is for me! 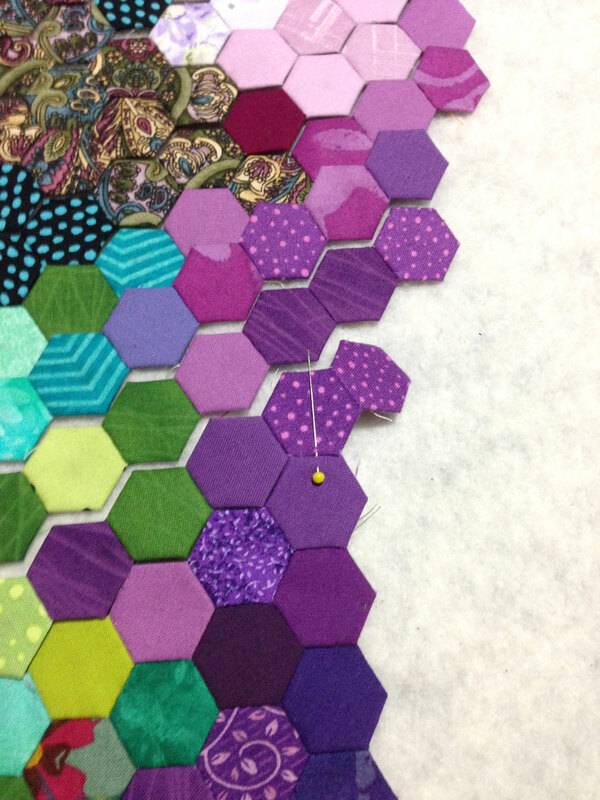 I’m going to play around with this today – I’m interested in making a few smaller projects with these hexies. We’ll see what speaks to me once I get all the colors divided. Woo Hoo! 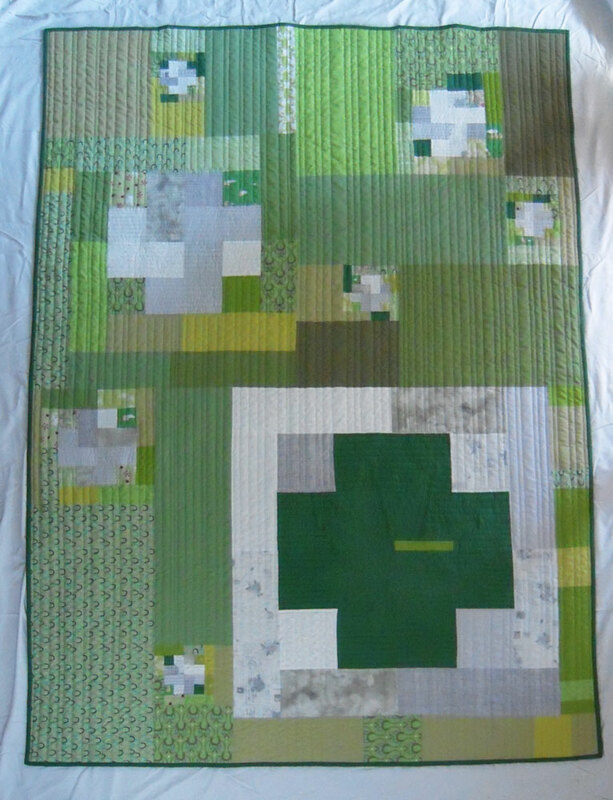 Just finished stitching on the binding to the Green Cross Quilt I’ve been working on – so now I’ll be able to bring it to the PMQG meeting tonight! 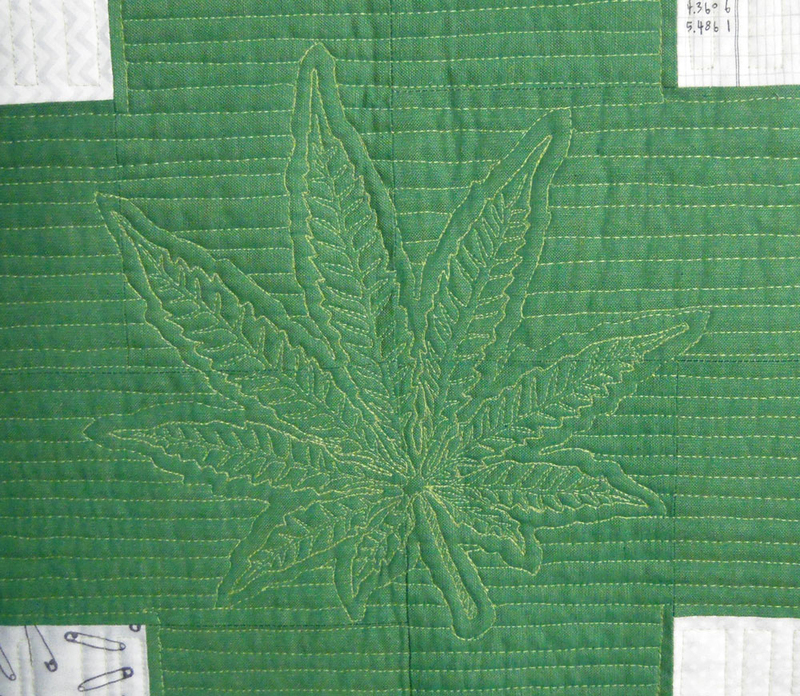 Okay… so I am totally in love with this quilt… and it’s more than the fact there is a cannabis leaf quilted into it – there is just something about it. Maybe it’s the wool batting I used. It’s so light and fluffy and feels so good. 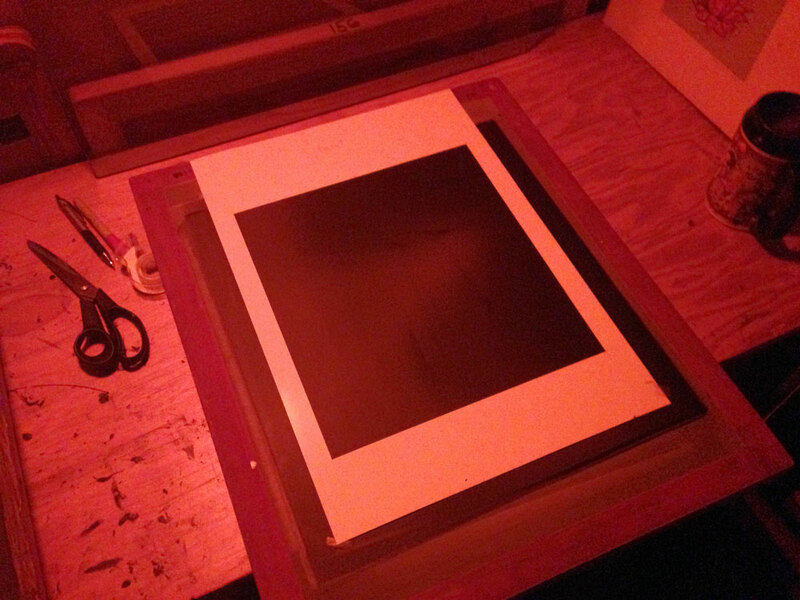 I think it’s a great size too at 58″ x 78″, long enough to cover my toes! 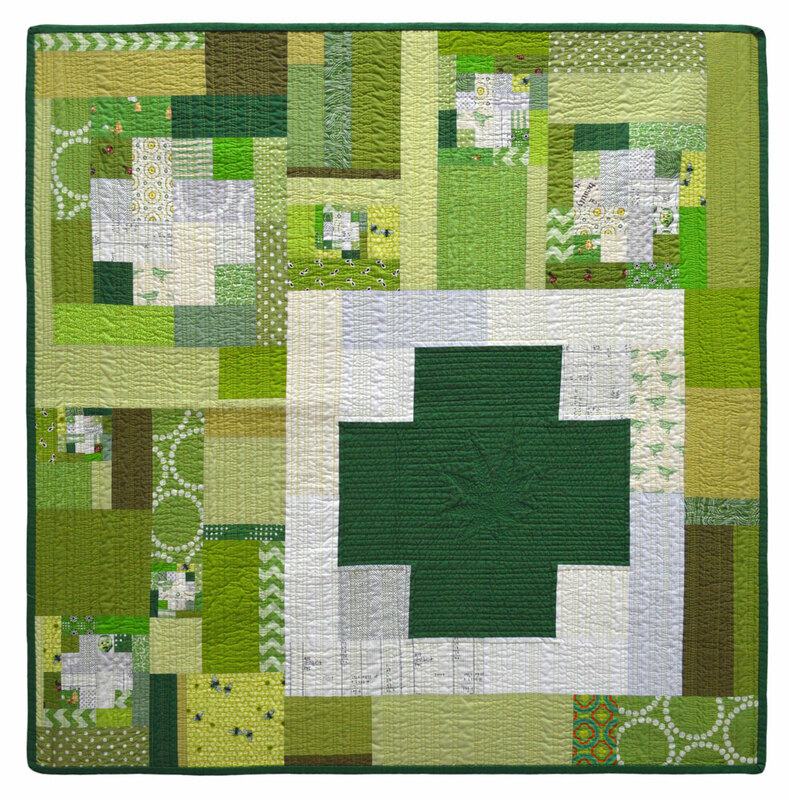 I hand quilted the straight lines in the green cross, leaving a little space between that and the machine quilting to make the leaf pop out a little. YAY! I’m pretty excited to show this one, and very interested in the response by my guild mates to the motif I’ve chosen. 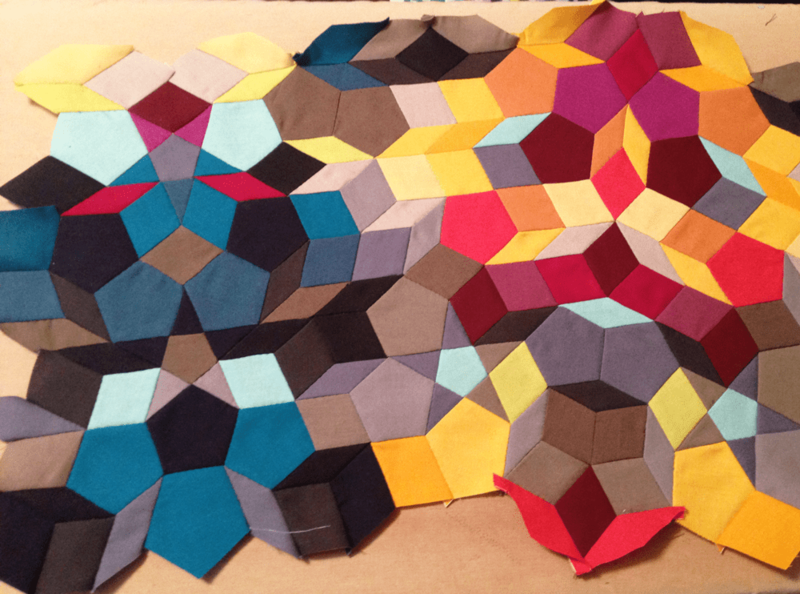 Conversation needs to start somewhere, and what better way than with a comforting quilt…? Beginning July 1, 2015, it will be legal to use cannabis recreationally in Oregon. I currently have a medical card, but it’s still very exciting – even historical! 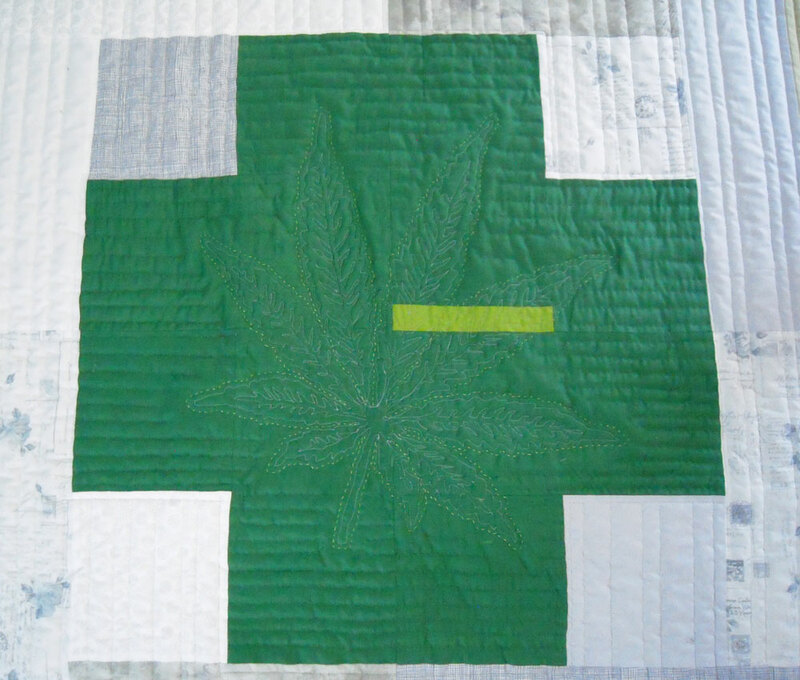 I began making a quilt at the fall PMQG retreat last October with every intention of quilting a big ole cannabis leaf on it. 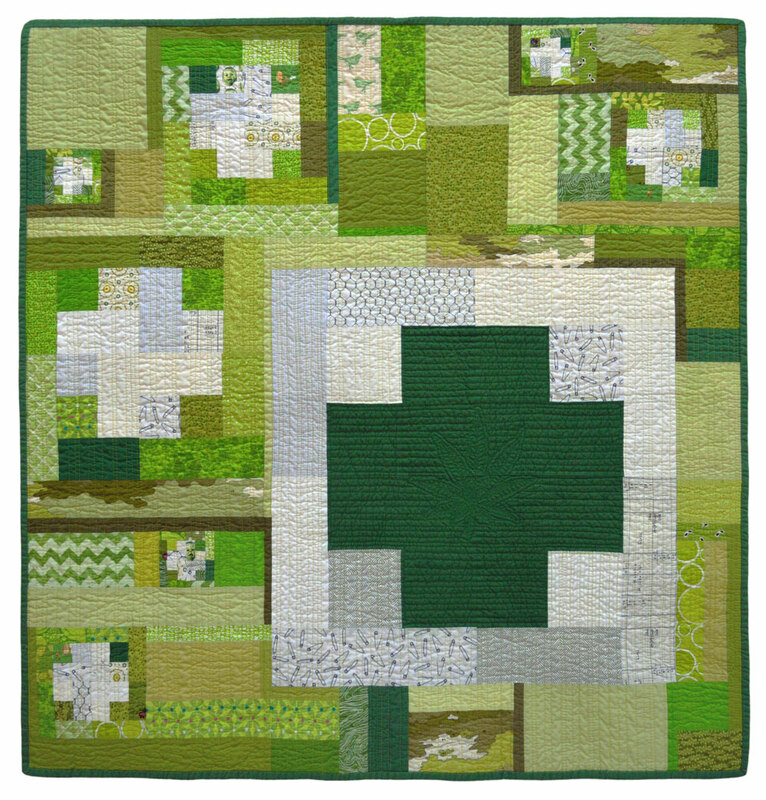 I’m calling it the Green Cross Quilt… and I’m loving it so far! Cannabis helps me sleep, and helps with my nausea… and changes my perspective a bit when I start to become negative. Yes, it can make me sleepy sometimes, but that’s about the worst side effect I’ve had. It also helped me kick a few addictions that were truly bad for me. Obviously I am pro-plant. How about you?